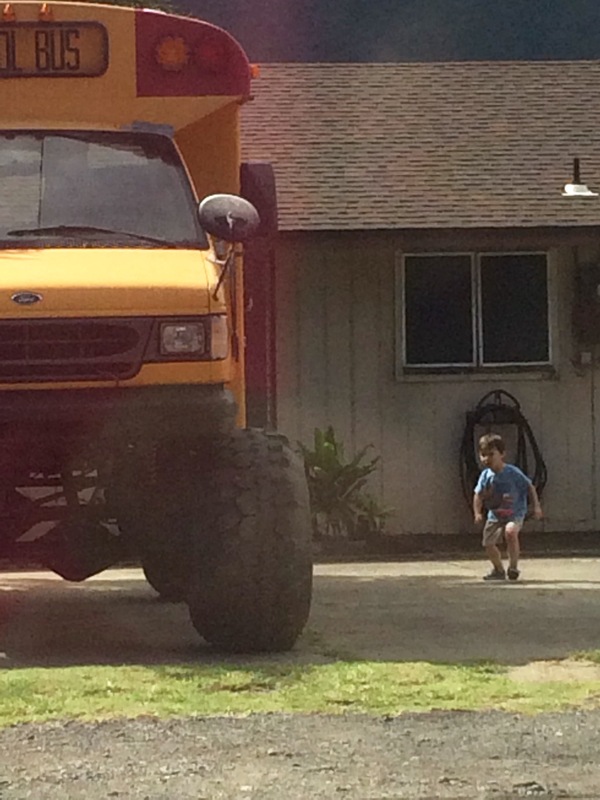 My son and his family bought a new house close to us that needed some remodeling. He is concentrating on upgrading the master bath and adding a second floor laundry. I’ve been spending most of my time helping out with small fixes. The kitchen cabinets are inexpensive thermo plastic covered and the countertops were linoleum. He read about a technique that used feather coating cement to update old cabinet counters to make them look like cement counters. I decided to start the project. 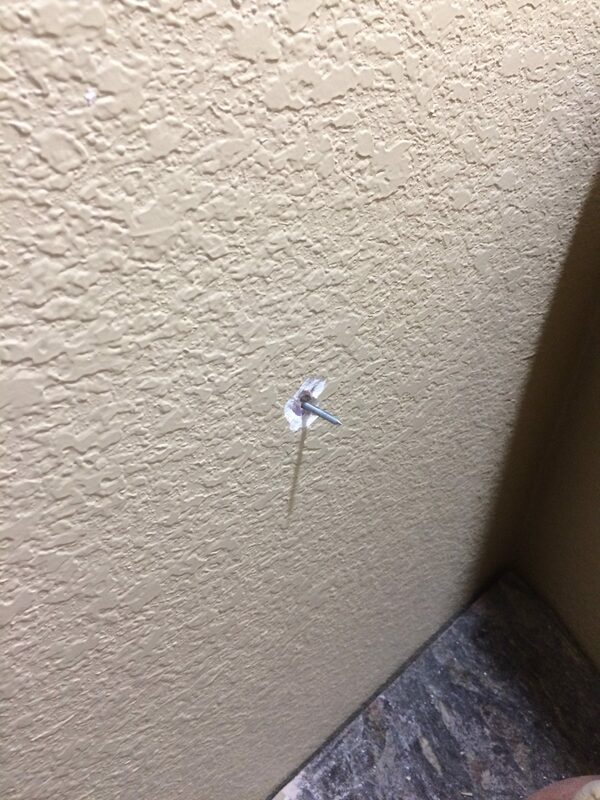 I removed the smallest counter to try the technique. All that is required is a box of Henry patching cement from Home Depot and a plastic trowel. Along with an orbital sander and various grits of sandpaper. First the laminate is roughed up with 60 grit paper. Then a small batch of cement is mixed 2 parts cement to one part water and allowed to slake for a few minutes then remixed. 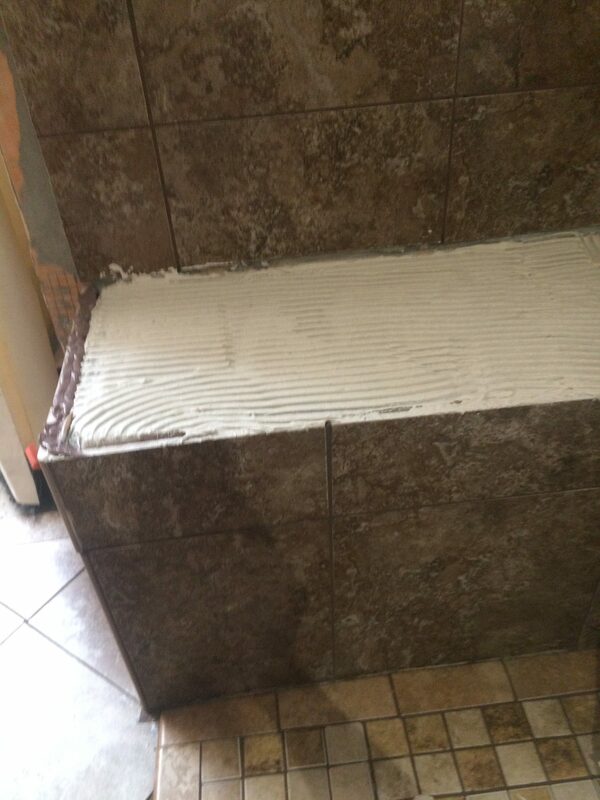 Then the cement is spread on the counter. A bit thicker cement is needed for the edges so waiting a bit for the batch to harden a bit works then the cement is smoothed down with a plastic drywall trowel. 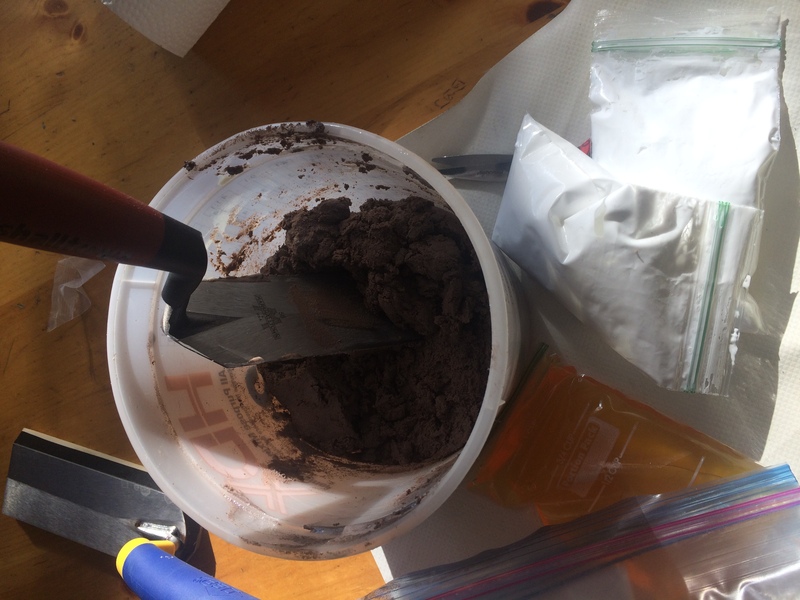 I also tried a metal trowel and a silicone scraper I used for the epoxy finish on my kitchen counters. The first coat is sanded a bit with a medium heavy grit. I used 100. The process of troweling on the coats seemed to add groovesin the cement. I tried various sanding tools. By hand and with the diamond pads and polisher. That came out with scratches too. But fewer ridges. After at least five coats of cement and sanding to 1500 grit including a wet sand I decided to try sealing. After three coats of sealer I put it back on the counter to judge my work. I didn’t like it. Too many remaining ridges and color variation. It looked a bit better from further away. One coat seems to even out the coloring. Now the second coat is drying. In the meantime we found three big slabs of Corian Zodiaq which is their quartz product and decided to abandon the micro-topping project entirely. It’s exactly what I would have picked for the kitchen. So now I just have to cut and fit it! Unfortunately, progress has slowed since we passed the final building inspection in December. Somewhat because of travel. We spent Christmas in Wursalen Germany with our daughter and family. 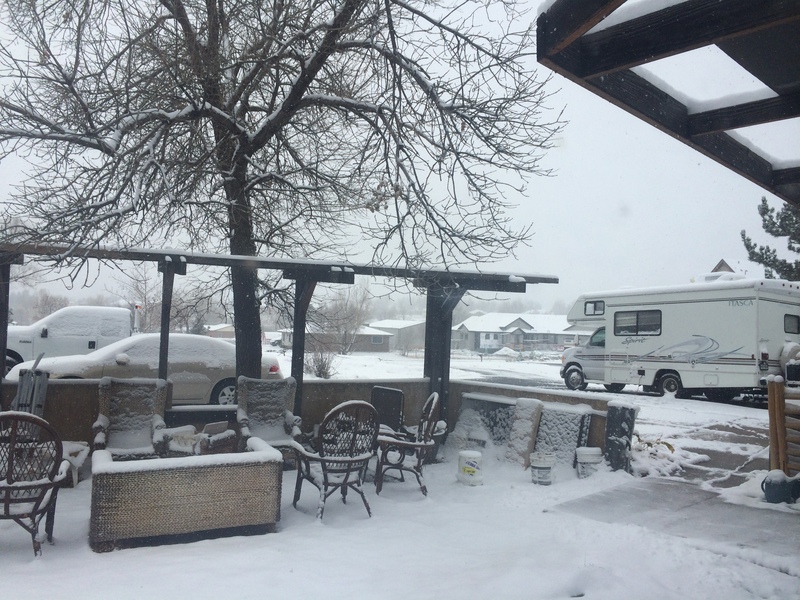 Then we returned for our grandkids birthdays in February. In between we visited our son in Arizona and had our middle son visit with his family. While leaving Dave in Germany I returned early to join my sister and family on a cruise to Cuba! 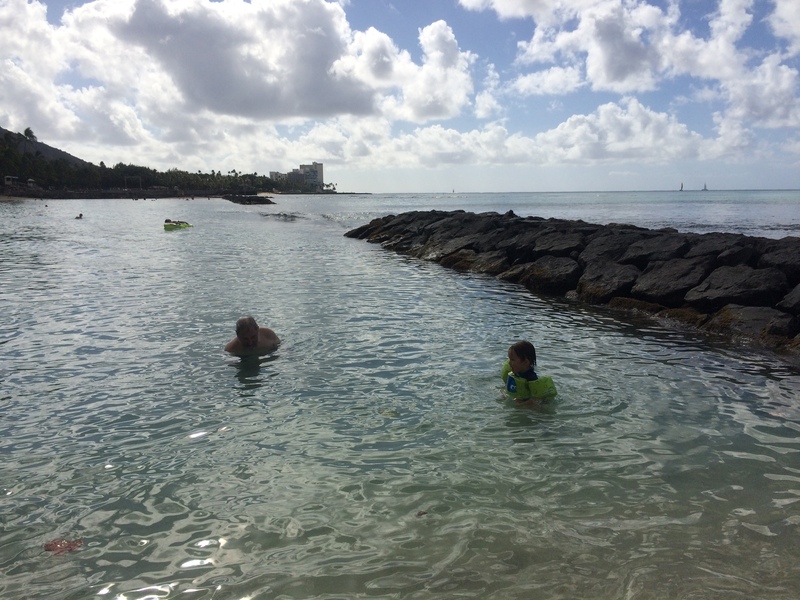 This was my first cruise and my sister and brother and cousin and nephew decided to do one together. So I was able to join them. We were eight all together and because my nephew is employed by the cruise line we were given VIP treatment. We received champagne and fruit plates and chocolate covered strawberries! After a night of travel we stopped in Key West for lunch as getting off the ship at a military base took a lot of time. Then we sailed on to Cuba! Which we toured in one of the famous 50’s cars. We stopped at Ernest Hemingway’s home and writing retreat. Then toured the city and had lunch at one of the new private eateries complete with roaming chickens in the yard. Finally visited a bit more with my brother at his winter resort in Florida and drove over to enjoy the fabulous Florida beaches. Warm enough to swim in March! So mid March returned to get back to work but not on my house! Working at my son’s house to remodel before he moves here this summer! Our house is basically all front doors. Besides all the living room french doors there are two entry doors. One door is to the airlock entry which we use most, the other is the old covered entry. We extended the master bedroom to encompass this door. So now we only use it to go out to the hot tub. Eventually I’ll think of a way to disguise the door to the bedroom so it is not confused with the house entry. I currently have the garden gate in front of it. But that has not done the trick. We decided a doorbell at the airlock entry door would help strangers and delivery persons to know it is the working front door. But when I installed my son’s monitoring camera system I decided it would be fun to have a camera. I didn’t want to spend top dollar so I bought a cheap knock off of the real thing for $50 at Christmastime. The doorbell was relatively easy to set up. Right out of the box I plugged it in to charge the batteries and it started a voice prompt that it was ready to pair. Of course I was not ready. I downloaded the Xbell app to connect to the doorbell and the steps were easy to follow and pairing worked the first time. The most difficult part was pairing the indoor bell which is a plug in device that starts to blink as soon as it is plugged in. It was not clear to me that the doorbell had to be pressed to pair the blinking receiver to it. Finally after several tries we had the device paired and working with the outside doorbell. 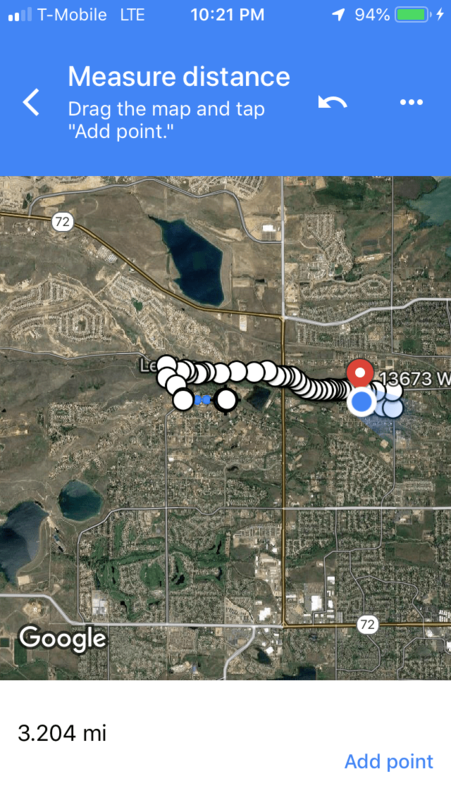 The settings allowed me to turn on the cloud recording and motion detection but even though it was on the lowest setting, and I turned off sound notifications for the bell, I was getting a doorbell ring on my phone every time the wind blew or shadows changed on the front of the house. So I had to turn motion detection off. I may be losing video of motion detection just to keep from false notifications. I can look at the camera’s view at any time and take a still shot or video that goes to my photos. The night vision on the camera is quite good. And the day vision is adjustable for various light conditions. I have it set on dynamic. I’ll experiment with the settings for lighting the scene. Although I am not monitoring energy use, this is a type of monitoring. Especially for noticing that there are folks viewing our front door sign that says we are a LEED project under construction. We spent Christmas and New Year’s with our family in Würselen, Germany. 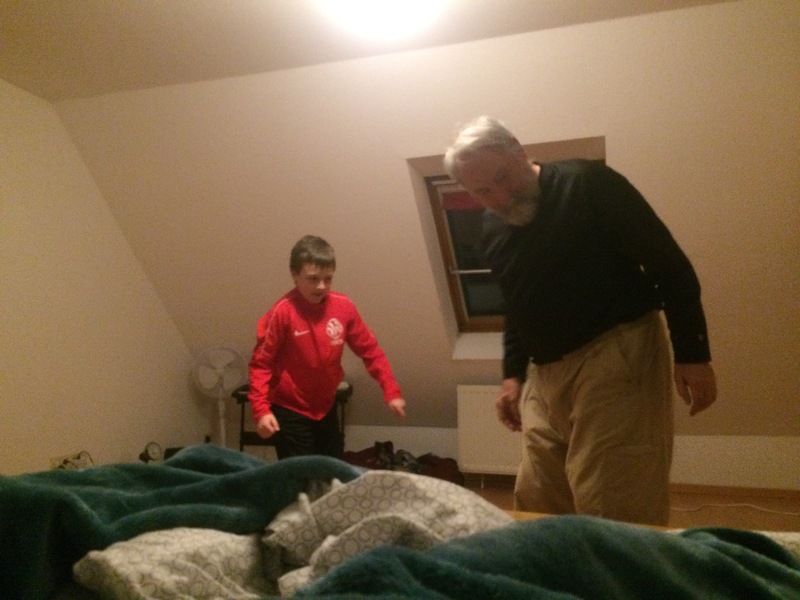 They have a very comfortable apartment there with a huge guest room that was inviting and big enough for ping pong ball soccer played by the grandson and grandpa. Our granddaughter made our beds for us which consists of a bottom sheet for each side of the bed and a pillow cover. Each side also has its own soft fuzzy blanket folded width wise and a duvet covered comforter to match the sheet also folded width wise. When going to bed the fuzzy cover and comforter are unfolded and laid out length wise. 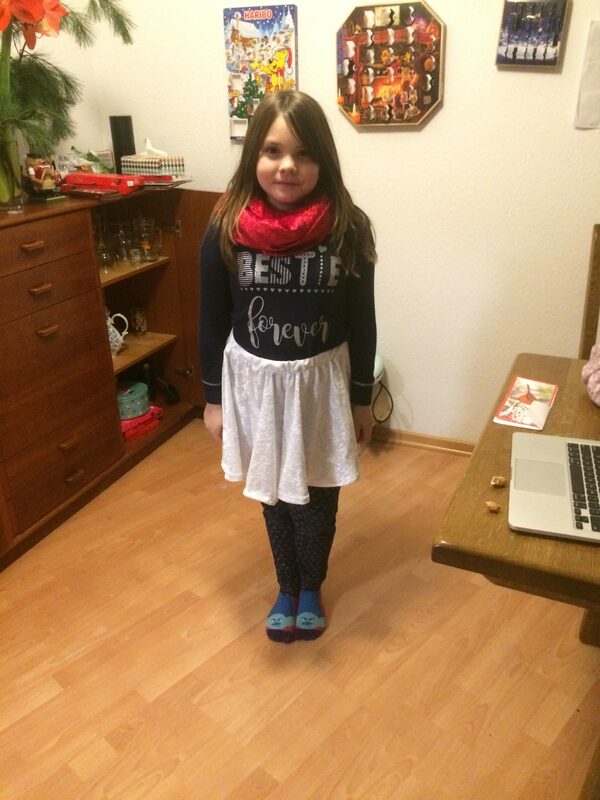 She is seven and told us that is the German way! There are also no box springs on these European beds, they are like Ikea beds with ladder like wooden springs. She also told us the bed came with the lattices assembled incorrectly and they had to fix it but now it was done and more comfortable. So cool that she is learning different cultural customs. 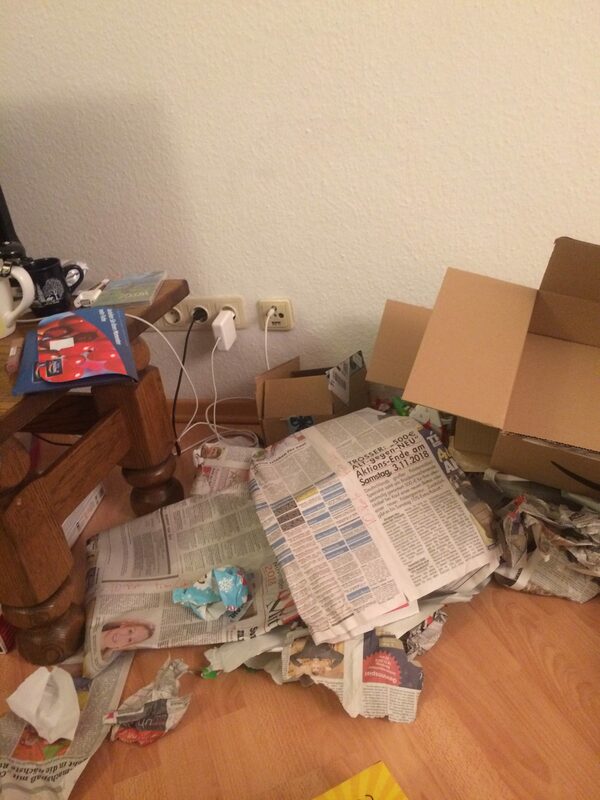 As at home family Christmas celebrations we enjoyed strewing paper and boxes all over the floor. We were treated to a traditional German Christmas feast of sauerbraten and red cabbage. 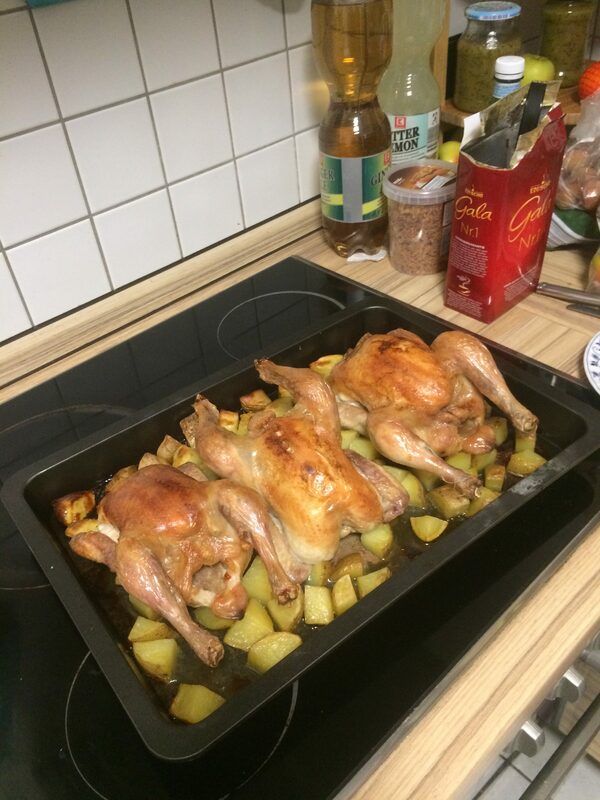 In fact we had several great meals during our stay; from ham to lamb to little french hens. Most mornings my son-in-law walks to the bakery for fresh rolls and bread. The white rolls are ubiquitous and quite good but the chocolate croissants are exquisite. We enjoyed being with the family and did a little touring as well. 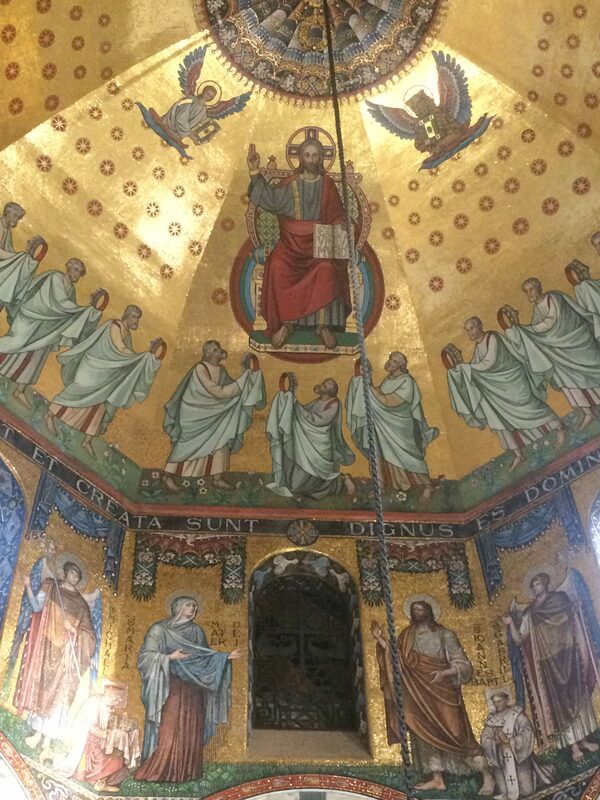 Visited the Aachen cathedral which was originally commissioned by Charlemagne who suffered from arthritis and spent his time in Aachen in the healing warm waters. We also visited the thermal baths and enjoyed the German version of warm soaks. The family traveled to Ghent in Belgium to see some friends and visit a Viking exhibit in a museum but I wasn’t feeling well so I stayed home. But I went with to visit the small town of Monschauer, famous for its Christmas markets that were already closed but many of the shops carry Christmas market types of items there. It is an old stone town with every building, road, walkway and fence made of stone. 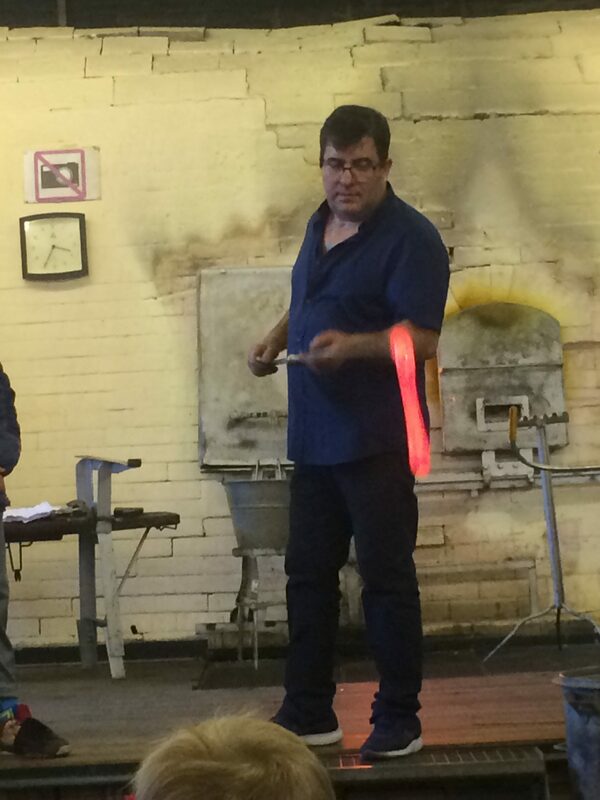 We walked through town and up to the castle and then to the glass blowing market where we enjoyed watching the kids help make blown glass plant watering globes. Before leaving town we stopped at a mustard market. Monschauer is famous for mustard. One of the most exciting nights was New Year’s Eve from our own apartment balcony and the streets below. People from the neighborhood gathered on the street sharing warm mulled wine and shooting off fireworks or burning sparklers. I watched the festivities from the balcony and the fireworks came from all over town instead of a concentrated show like we have for the 4th of July. Although I went to bed the fireworks continued for at least an hour and a half and then it got quiet again. Germans have a quiet rule on Sundays, no loud noises are allowed. No mowing the grass or using power tools where others can hear them. Even practicing an instrument is not condoned. We also spent time learning to use the sewing machine my granddaughter got for Christmas. She had several projects in mind and she got a great design ideas book with patterns to make some clothes. We started with her running the foot pedal while I held the material and she chose the decorative stitches we used. Then she held the material and I ran the foot pedal and finally she did both while I helped keep the material aligned. We used a strip of painters tape on the machine to help her line up the material at the foot. 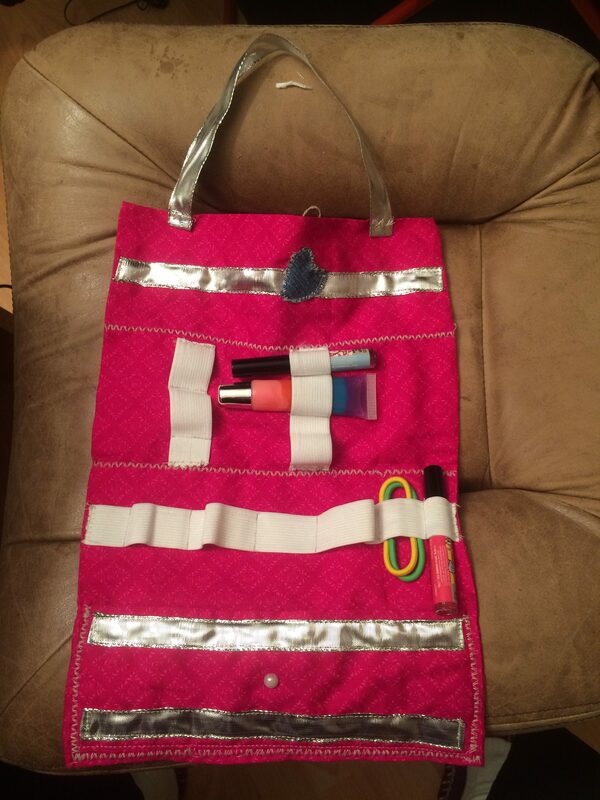 This was an idea from her sewing book. I also worked with her mom to help her remember her sewing skills from childhood. I hope they have time to sew together. It takes a lot of time and vacation is good for working on such projects. 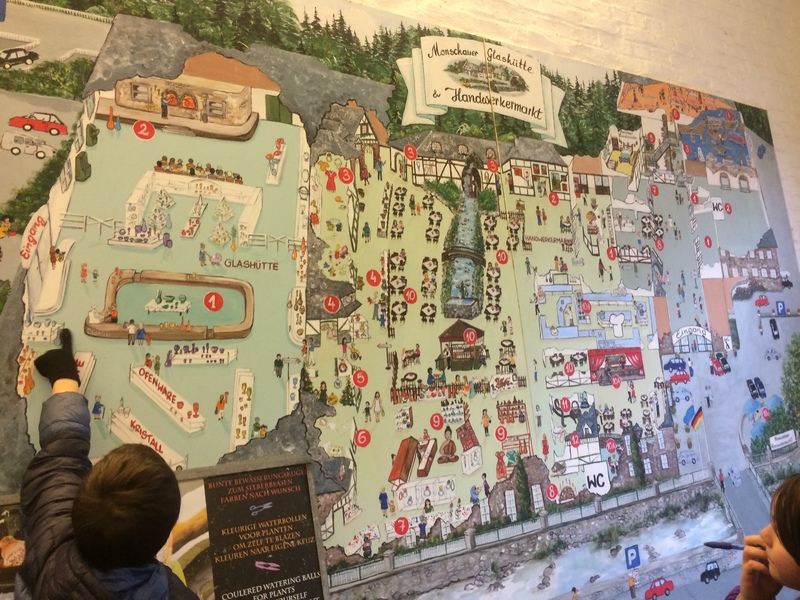 We spent a couple of days with the kids at the local indoor pool. My granddaughter is swimming with the Würselen swim team. But the pools were open mostly for playing during school vacation. 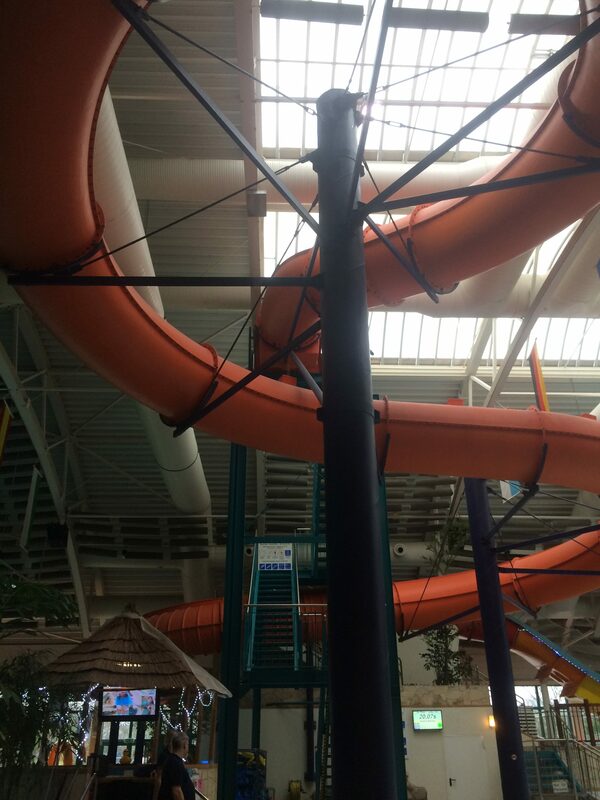 There were two large water slides and a wave pool that was turned on for about five minutes at the top of every hour. 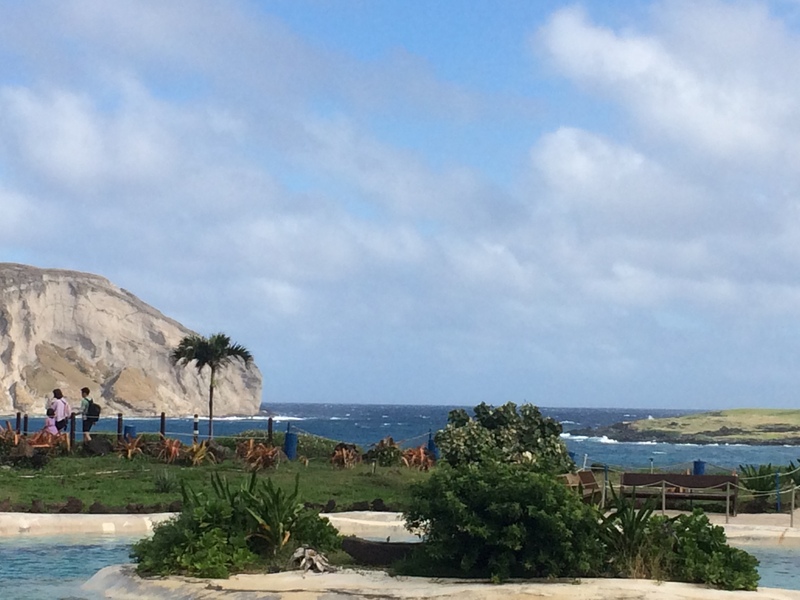 Also a lazy river around the pool and a large pirate ship playground with warmer water for littles. There was one bubble pool but the water was not warm like a hot tub. 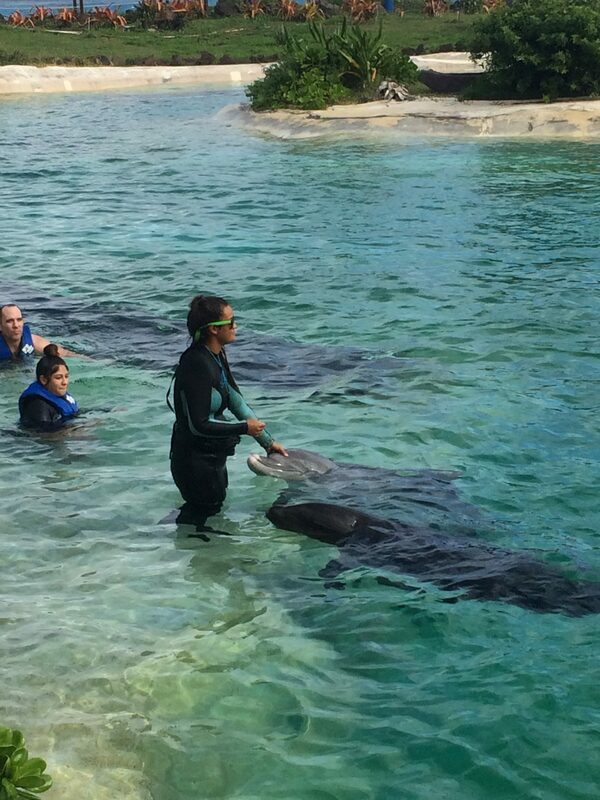 It was called the Aquana and it is a pretty cool activity located so close to their apartment. We were very happy to be with the family. We miss them terribly and hope their time there is over quickly. But we see the advantages too, for the family and for us as travelers. Posted in -Chronological Recent Posts, Distractions	| Comments Off on Happy New Year! 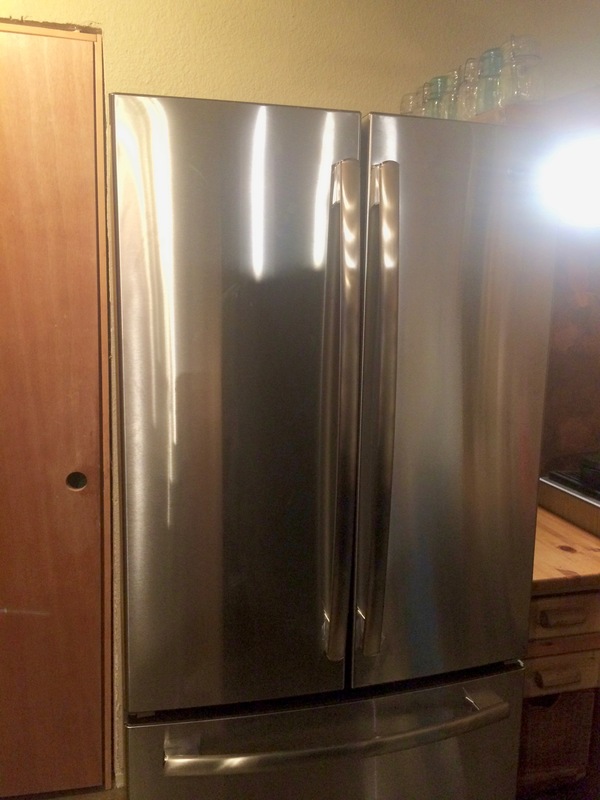 Our used Energy Star refrigerator was making a lot of noise. It was also starting to use more electricity and forming ice at the top of the freezer. The temperature was not staying constant either. All of these issues led to the concern that the compressor was going out. Our energy company Xcel Energy offers a refrigerator recycling program for consumers to upgrade to more energy efficient models. But they do not offer the rebate if the refrigerator is not running. That meant replacing our refrigerator before it broke to qualify for the free pickup and $50 rebate. The refrigerator fit our kitchen exactly so it was difficult to replace with a bottom freezer model. Our requirements were an Energy Star counter depth bottom freezer that was not larger than 33 inches. This combination was almost impossible to find! Samsung makes some refrigerators in this size but they are not rated Energy Star. 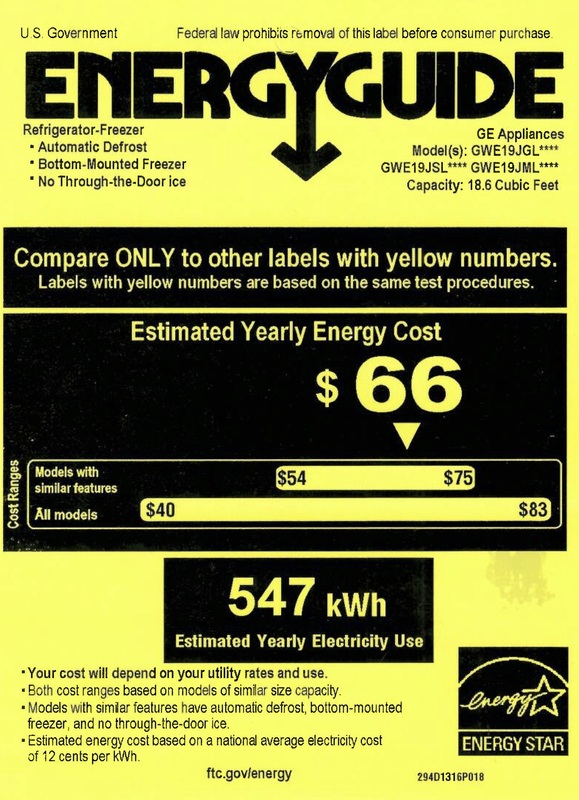 I downloaded the Energy Star excel spreadsheet for refrigerators to find possible models. The result was that there was only one real choice that was not a built in or foreign and outrageously expensive. I ordered this model from Lowes as it was on sale for Black Friday and also purchased a 10% off coupon from an eBay vendor to help with the cost. The new refrigerator is only a little larger in capacity and uses much more electricity than the older one rated at 378 kwh/year. But my energy use monitor usually registered a higher usage than advertised at about 450 kWh/year. Still less than the new one at 547 kWh/year for only 1.1 cubic foot increase in size. Because I needed to have the gap behind the refrigerator as small as possible I have not added the energy use monitor plug to this new appliance. 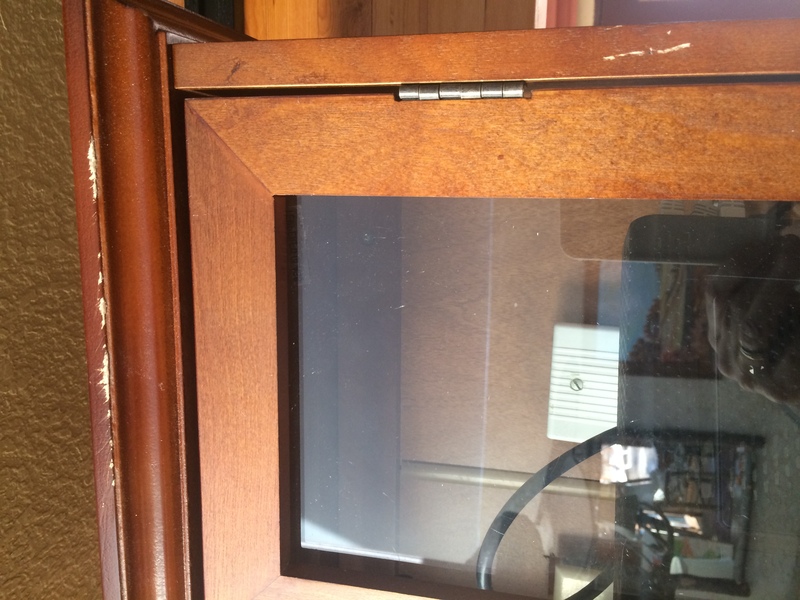 I also had to cut the edges off the cabinet between it and the stove and move the stove cabinet down about an inch and a half to fit this in place of the old one. 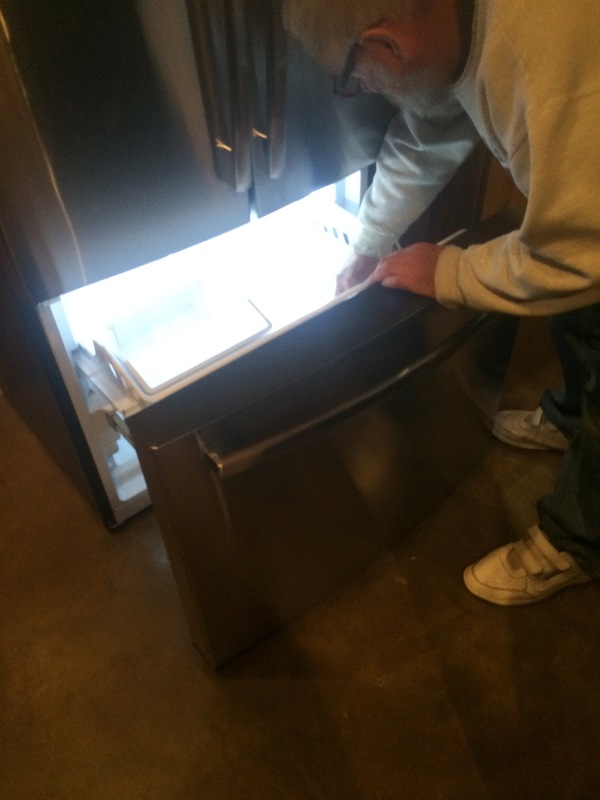 But this new refrigerator is much easier to use than the older deep and low unit. The freezer baskets are more accessible although I wish the ice maker tray was less wide. The refrigerator and freezer have bright LED lighting and the refrigerator above offers lots of shelving options so that it seems to hold quite a bit more than the old one. And our old refrigerator was moved to the front hall where it stayed plugged in until the vendor for Xcel came to pick it up. We received a check for $50 in the mail shortly after the pickup. I’m glad we were able to replace it before it broke. That refrigerator only lasted about 9 years and we had it for four of those. I hope the new one lasts longer. My son and his wife have decided to move their family closer to us! 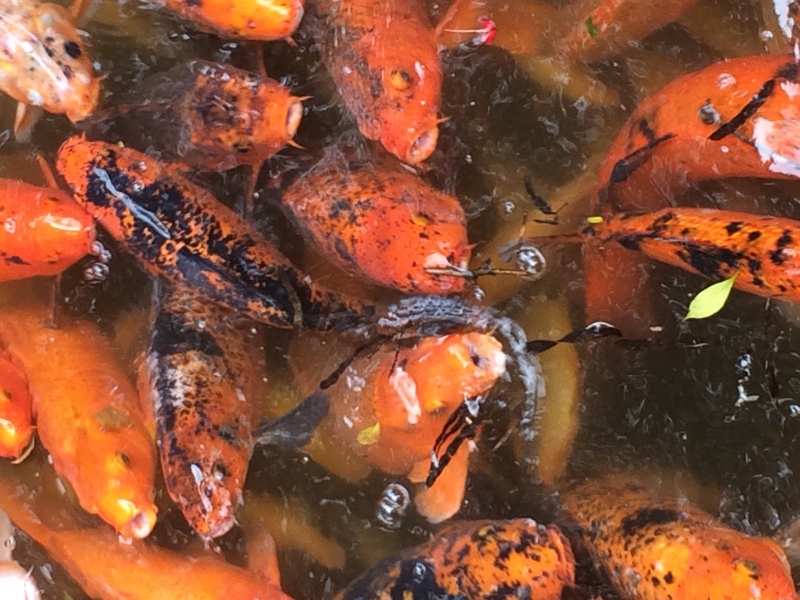 I have been seriously searching real estate for them since this spring. Home prices went up about 8-10% in our area this year. But there was a bit of a lull as winter came on. This beauty had most of the items on their wish list. It’s a bit further away from us than my daughter’s house-about 3 miles. 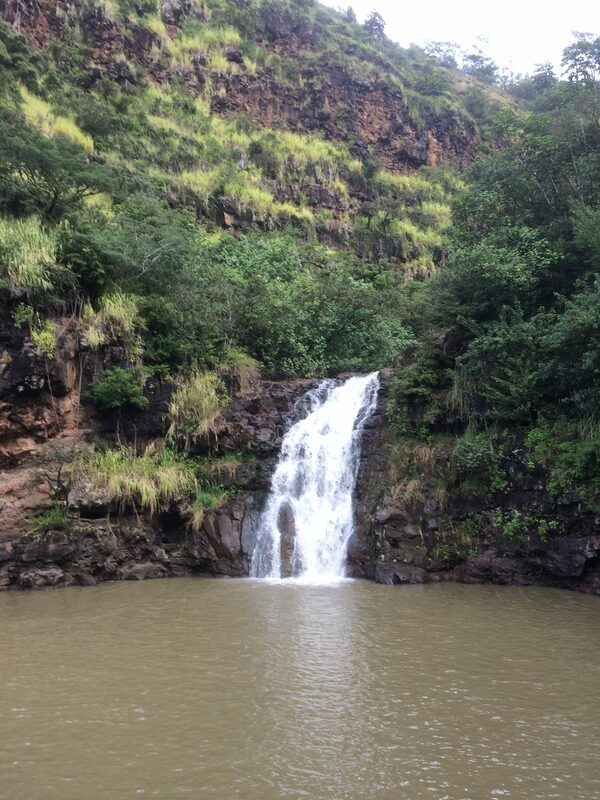 But there is a pleasant trail for most of the one hour or so hike. We are excited to help our kids do some remodeling in the house. Even before the sale went through I had a project! 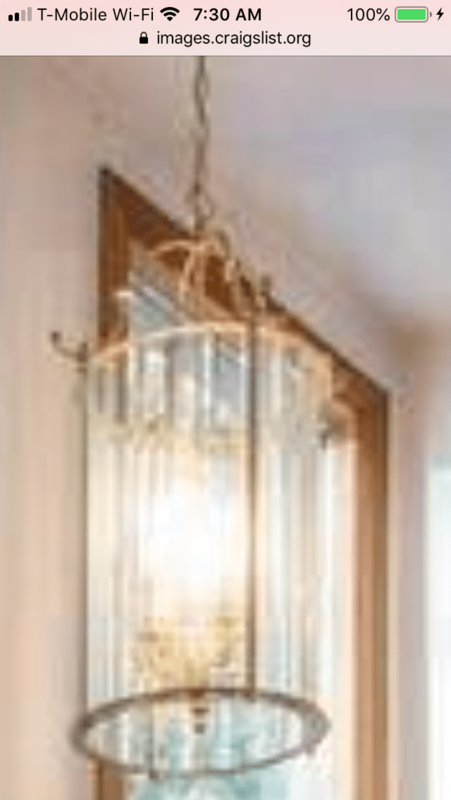 The entry/stairwell light is classic but a bit dated. 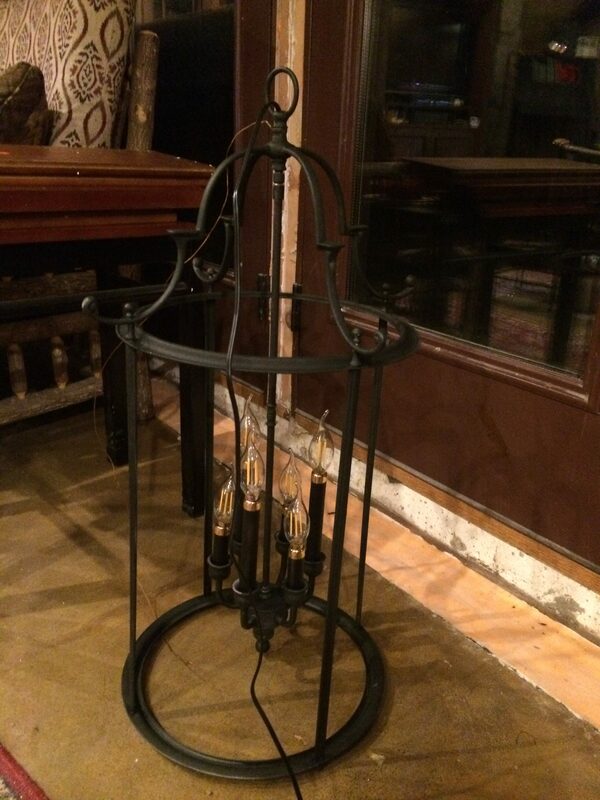 So I looked for a more lantern like alternative. I picked up a free one through Craigslist. And I took it apart to spray paint it flat black. I used cardboard boxes as spray paint tents. And I used a metal primer on all the pieces before the final black. It took several coats to get the pieces all painted. 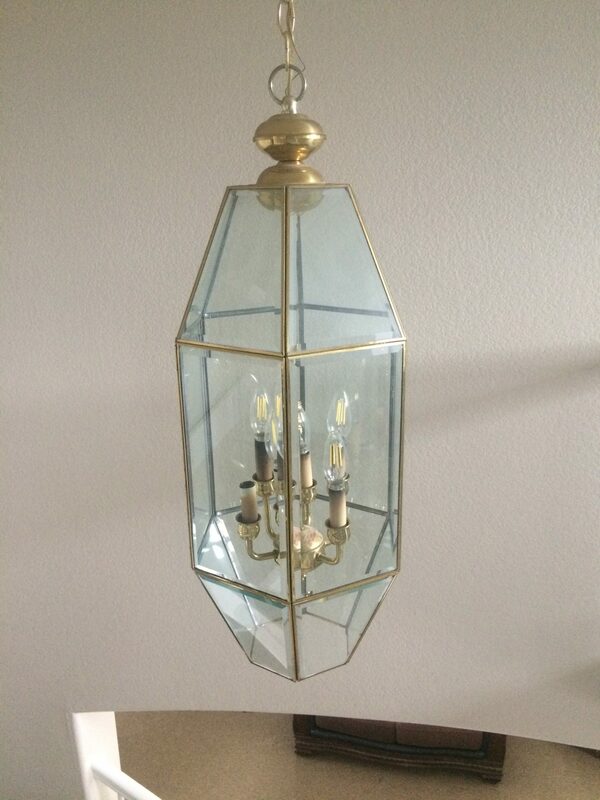 I bought LED chandelier bulbs to get started on their energy efficient updates too. I’m looking forward to hanging it although I have not decided whether to put the glass pieces back in. It looks more modern without them. 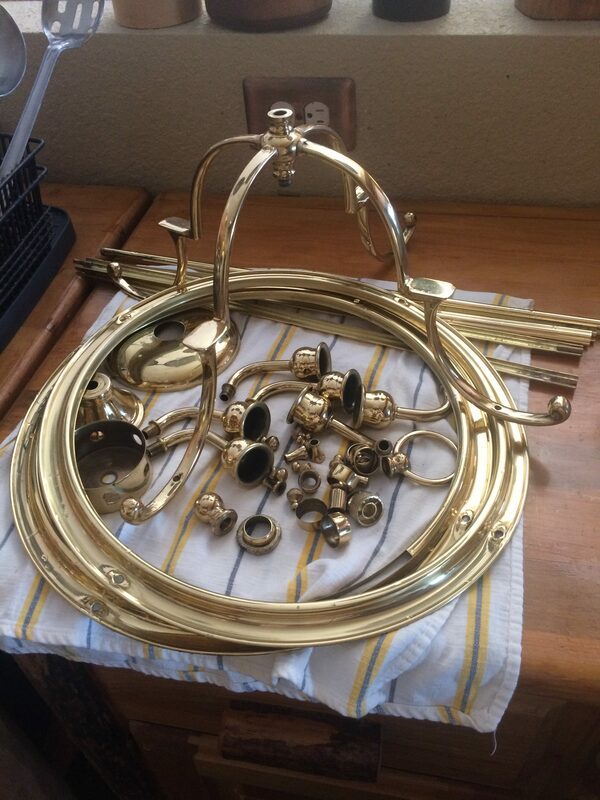 I had to look up the order of the hanging pieces as I forgot to take a “before” photo. Just a couple weeks later it has been hung! We passed the final remodel inspection this week! I had scheduled the final again a couple of weeks ago but when the inspector arrived he said he could only do structural. So I called in and scheduled the correct type of inspection for December 19, 2019. 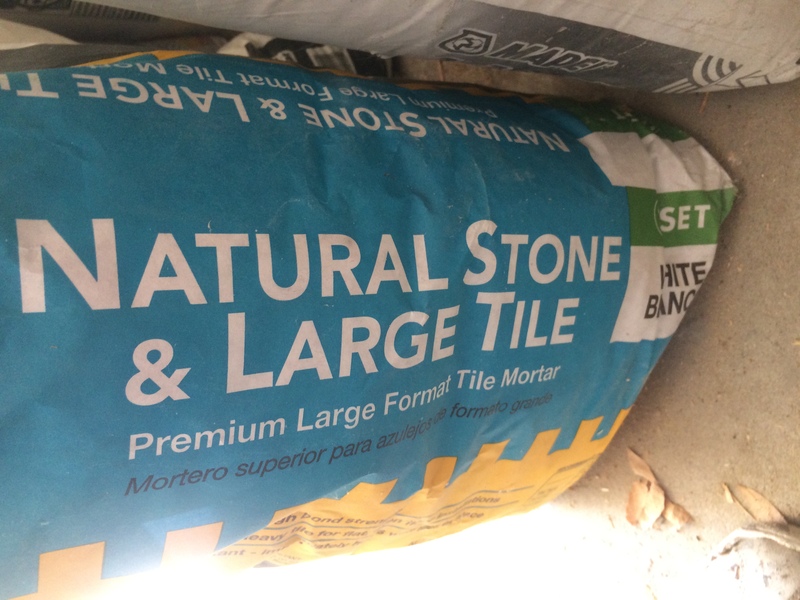 True to the great friendliness and cooperation we have gotten from the Arvada Building Department, the inspector who came out was very nice and looked at the items that were on our last failed list. We scheduled a final last February when we knew we weren’t done, but had to have an inspection to keep the building permit active. 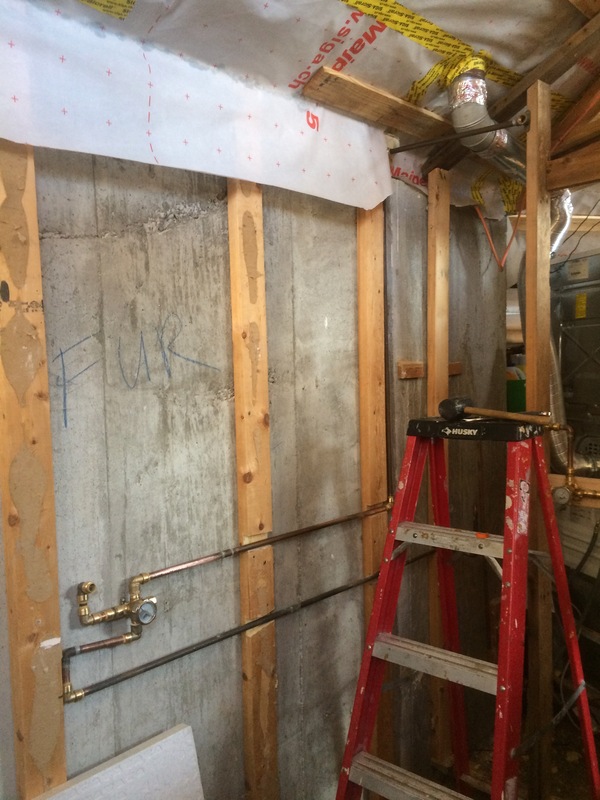 On the list were the master bath shower floor, the family room bathroom shower, one toilet that needed caulk, and the fact that the breaker for the GFCI’s was off but I could not find it as it was mislabeled by the worst electricians ever. He checked those items and then said we passed. Woo Hoo. 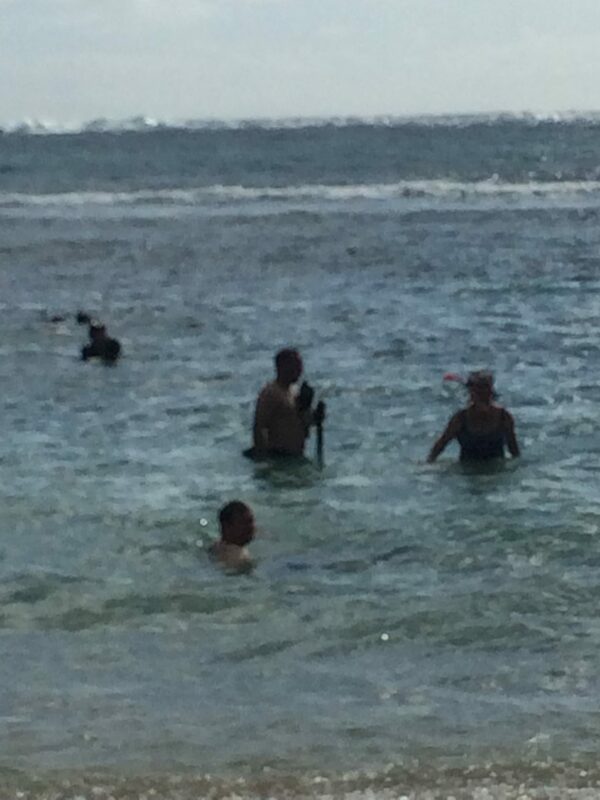 He said he remembered coming out for rough plumbing a long time ago. Yep it has been years. But the building department stuck with us. In fact, Dave has written a letter thanking them for their attention to detail and friendly cooperation with our unusual project. After concentrated work on the family room bathroom shower we finally had the indoor work that needed inspection completed and we got the final approval. Wonderful! 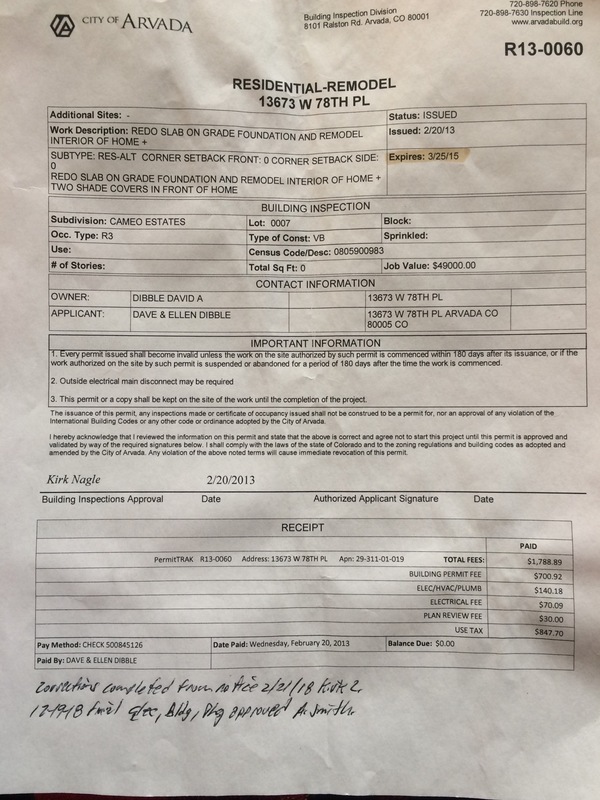 The note is just at the bottom of the original permit. But it is also entered into the online residential address database. This is a major milestone. So grateful we got this far. Now to try to finish the remainder of projects for LEED certification. And all the trim and doors which don’t have to be inspected. 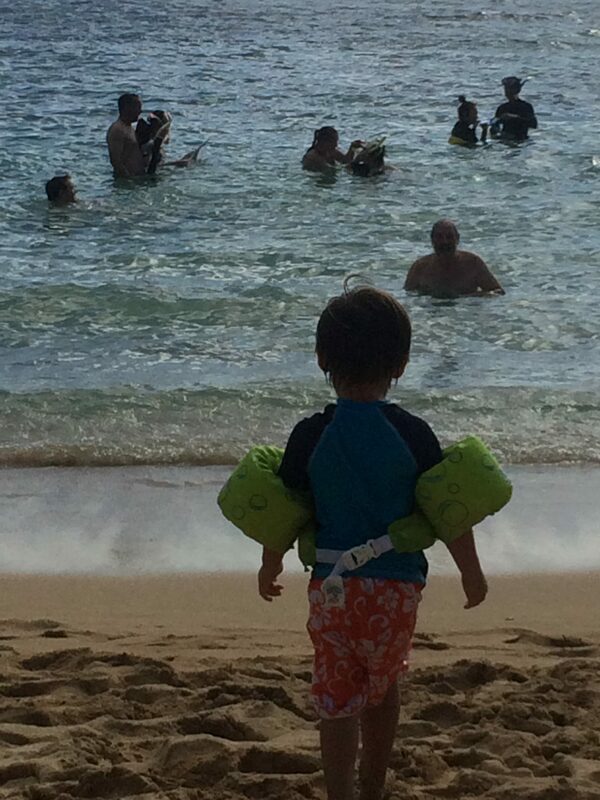 We were invited to a whole week in Hawaii with our son and his family. What a beautiful place and lovely distraction it was. We had a wonderful time with our two littlest grandchildren. They seemed to love the time together too. So much more than our photos captured. 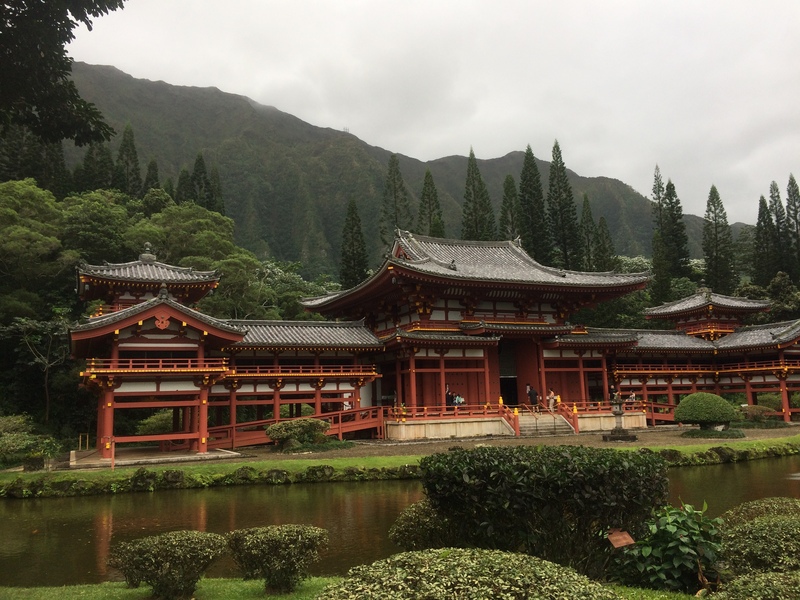 Posted in -Chronological Recent Posts, Distractions	| Comments Off on A Week in Hawaii! 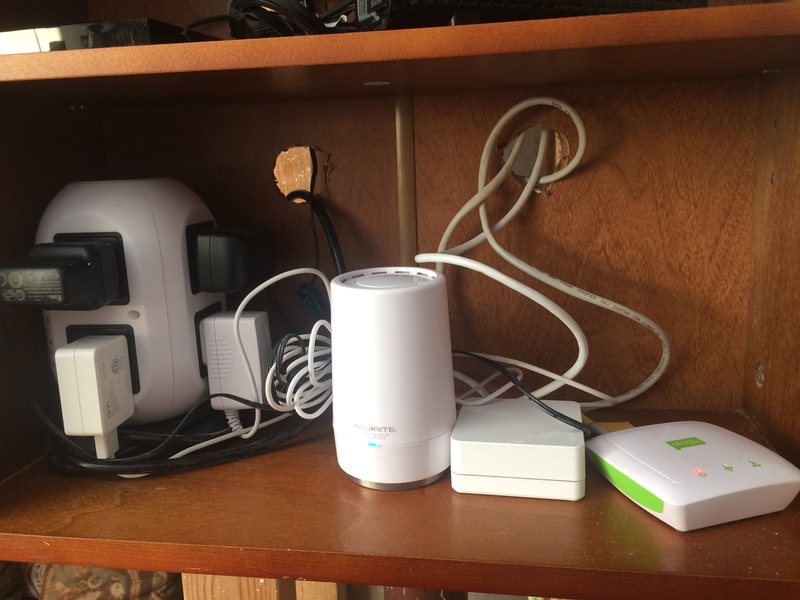 About a year ago I moved the internet modem to the living room from the hall closet. 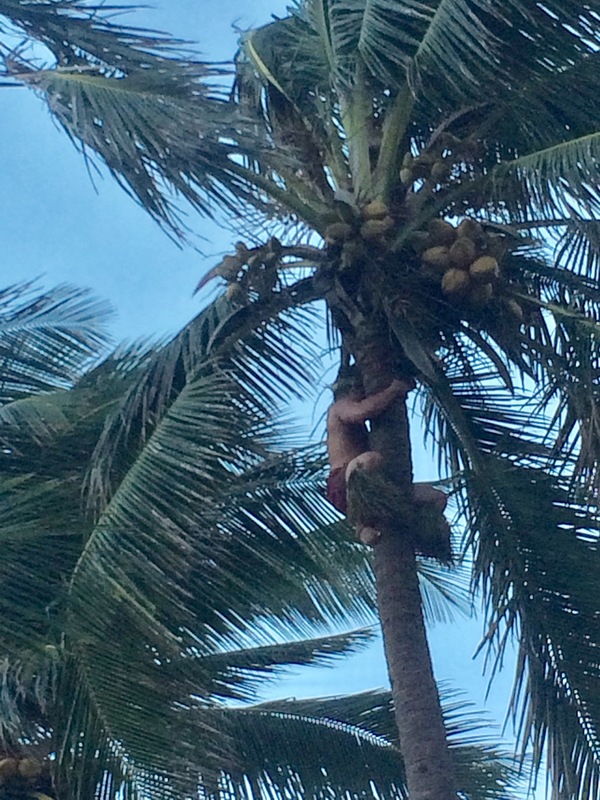 We were not getting a good enough signal at the back of the house. 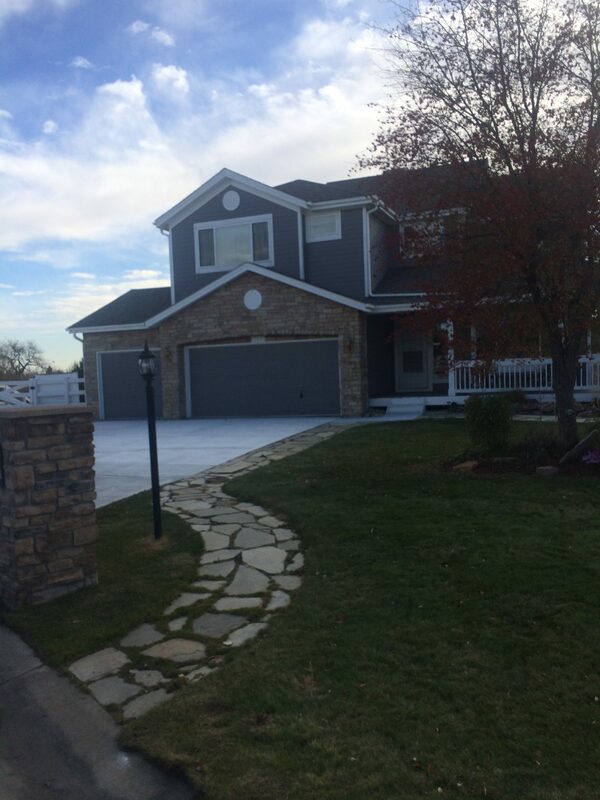 I have several types of monitoring systems that are connected to the modem and they need to reach from the garage to the back bedroom and to the hot tub on the front patio and greenhouse behind the house. The shelf I used was cobbled together and mounted on the post that will be covered with manufactured stone. I had in mind to buy a plexiglass shelving unit to enclose it. But they seemed to be very expensive and not exactly the size I needed. 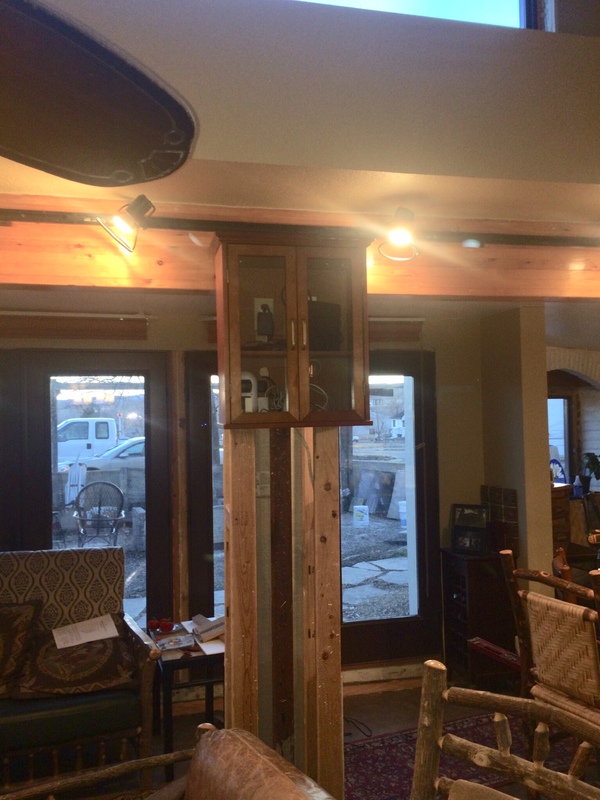 The backs were transparent and I would have to treat that in some way since the cabinet is mounted right to the 2×4 post framing. 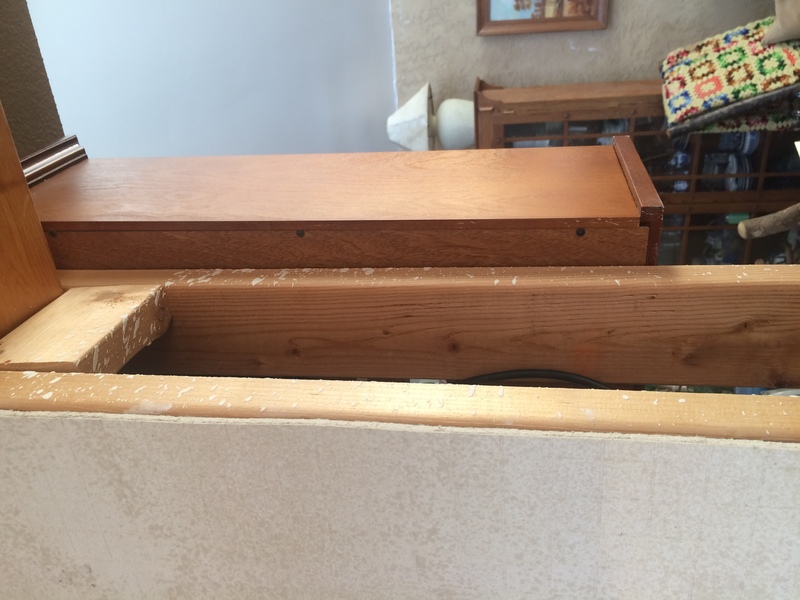 I wanted the cabinet to extend past the sides of the post enough to allow for the edges of the stone to be covered but not too much. I found an inexpensive glass door cabinet on Amazon and ordered it. I put it together and cut openings for the power outlet and cable entry at the back. Unfortunately my measurements were a bit off but the extra opening came in handy later when I was connecting the power and modem cables. I could only use one of the two shelves the cabinet included. 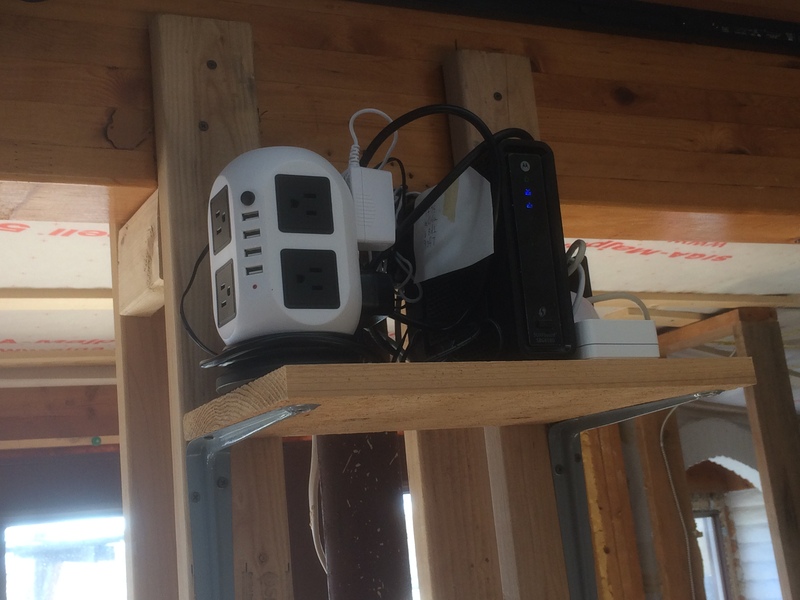 Although there was not enough room for both shelves in the cabinet the bottom and one shelf provided enough space for the modem and the various hubs my systems use. 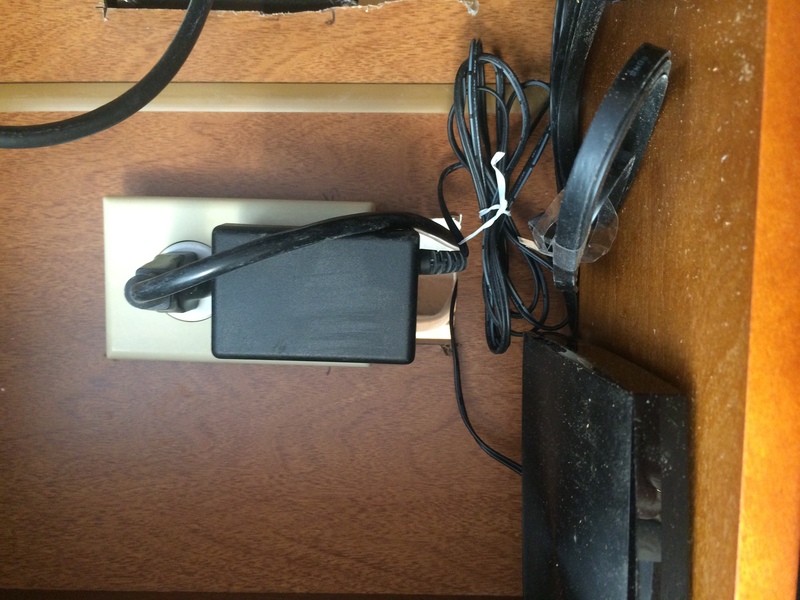 I drilled a couple more holes in the back of the cabinet underneath the shelf to thread the cables to the modem. Unfortunately while cutting the rear openings I did not protect the front of the cabinet so I’ll have to touch it up. It still looks much better than the temporary shelf. Now I can put on the rest of the backer board and eventually start the stonework. 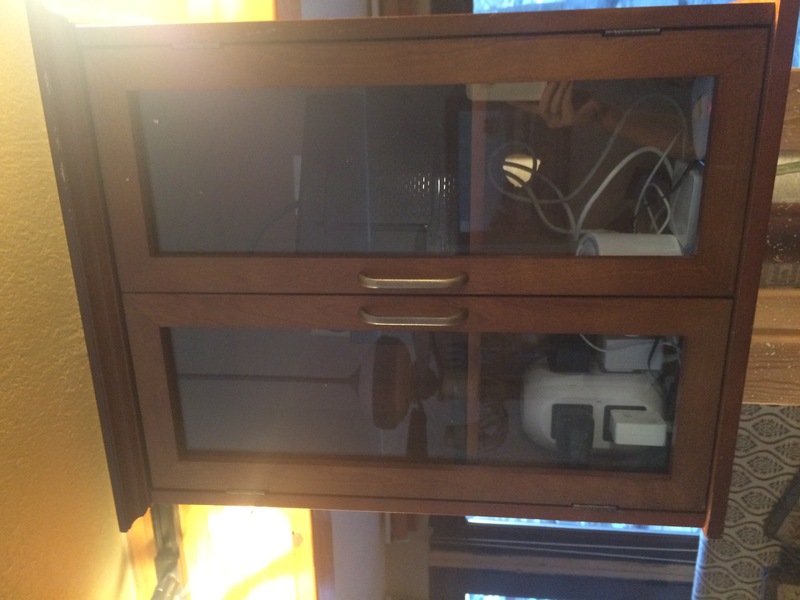 The equipment fits in the cabinet and the signal still reaches the corners of the house. 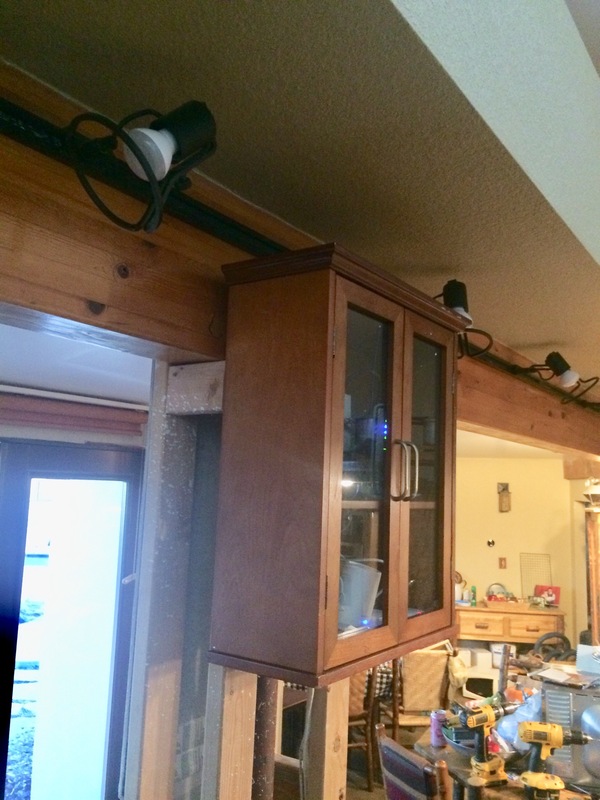 And the cabinet fits perfectly under and between the track lighting. A good solution for organizing the equipment. I mixed up the hot and cold piping to the shower. I had hot connected on the right side when it is supposed to be on the left. 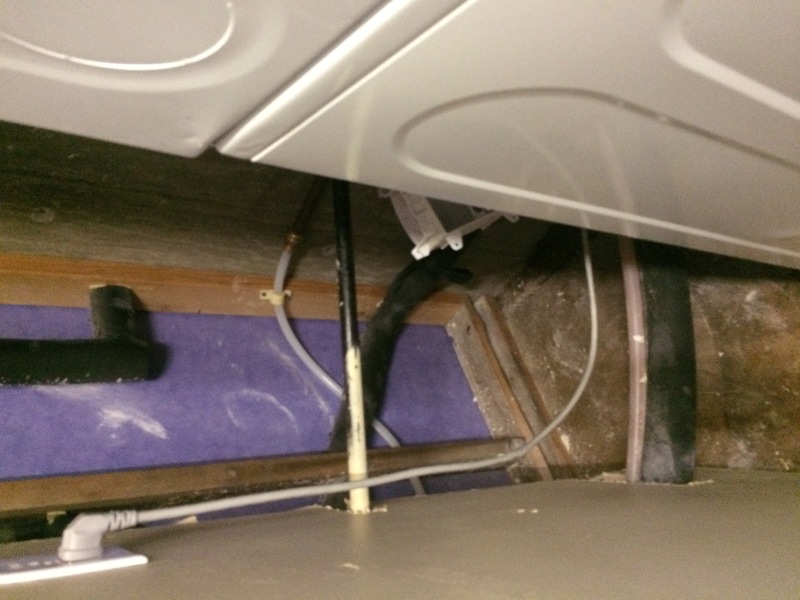 Fortunately the supply pipes are exposed in the utility room behind the washer and dryer. 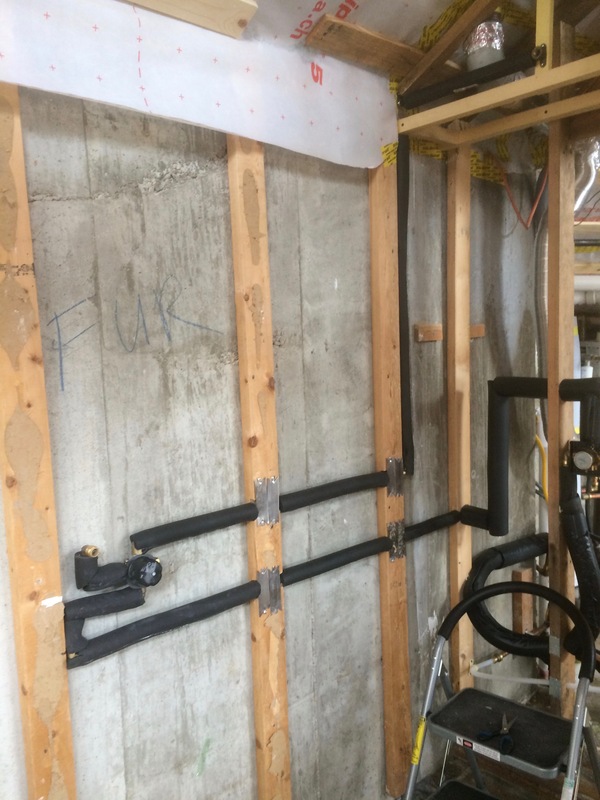 Here are those pipes when they were first connected. I moved the heavy set of stacked washer and dryer just enough to squeeze behind them and then work in a very small space. I had to crawl in and out a couple of times to get the right tools. The water was turned off but I had a bucket to catch the remaining water. I used the small step stool to get over the gas pipe and into the back corner. 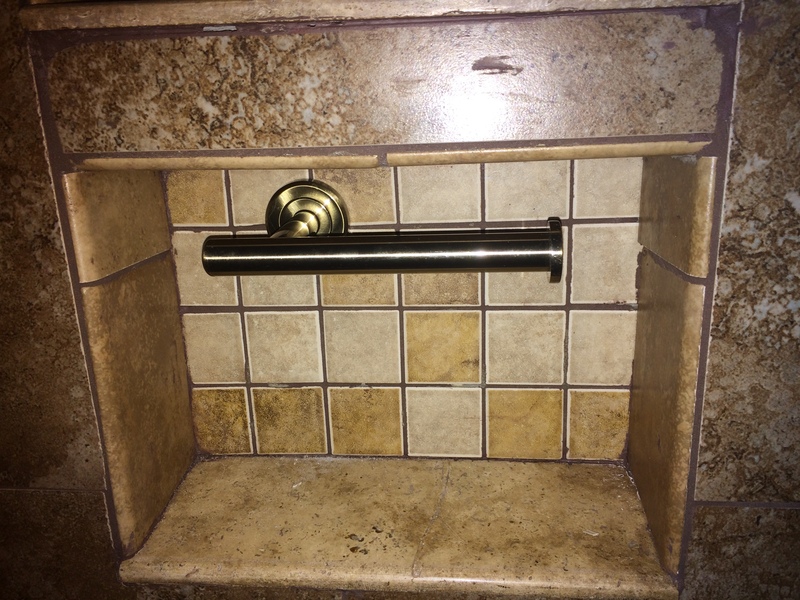 The connections to hot and cold are against the back wall. I removed the insulation which was on the cold side to get to the pipe connection. 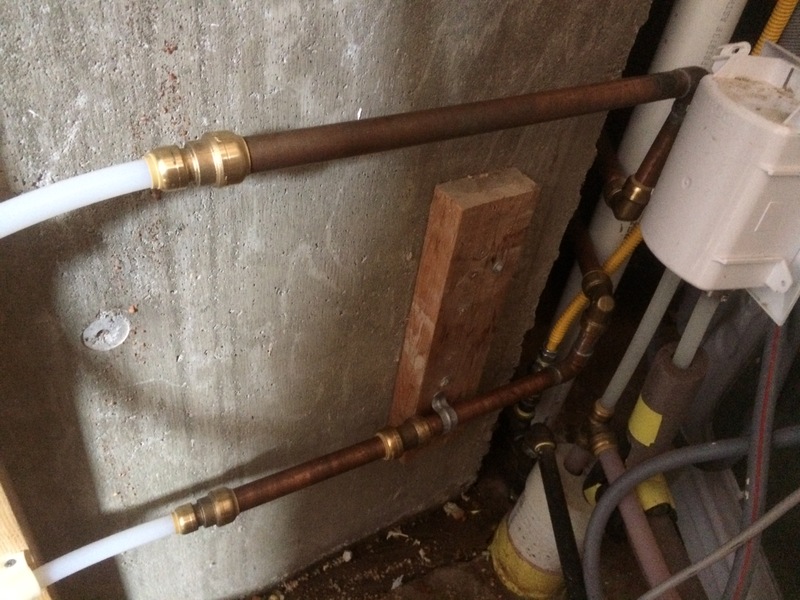 It was also fortunate that there was enough pex on each side to reconnect them. Of course using shark bite connectors meant all I had to do was separate the connections and switch them. 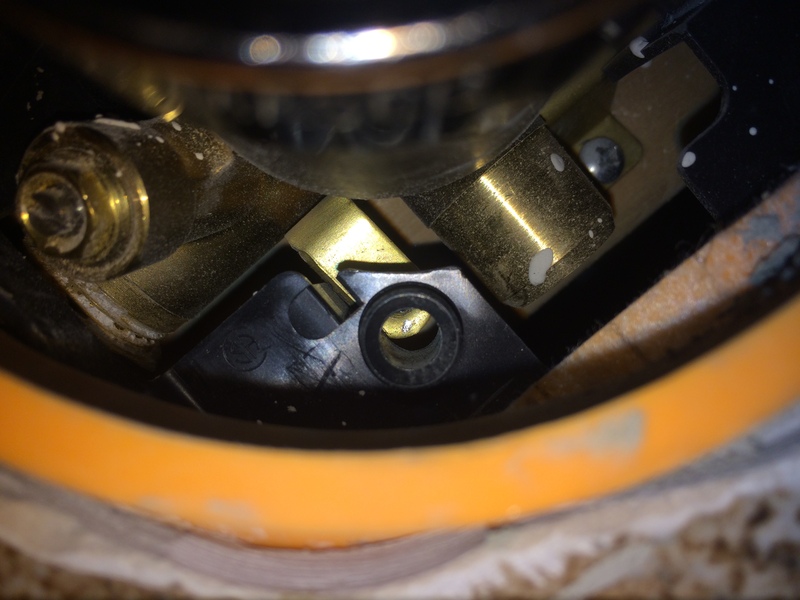 The pipe to the left side of the valve was insulated so I only had to replace part of it on the pex where it was unprotected. 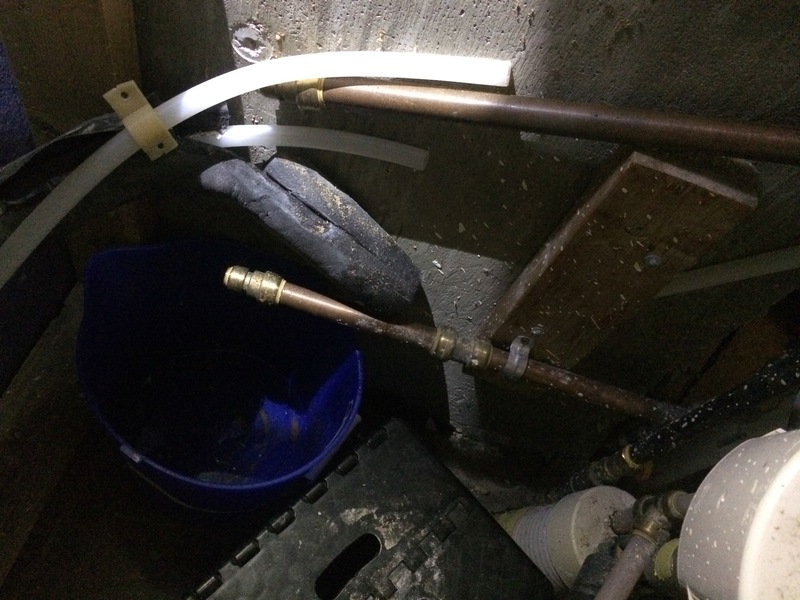 Then I added insulation to the copper hot water pipe. I left the insulation off the cold pipe. This is the finished job that shows the space I entered to get it done. 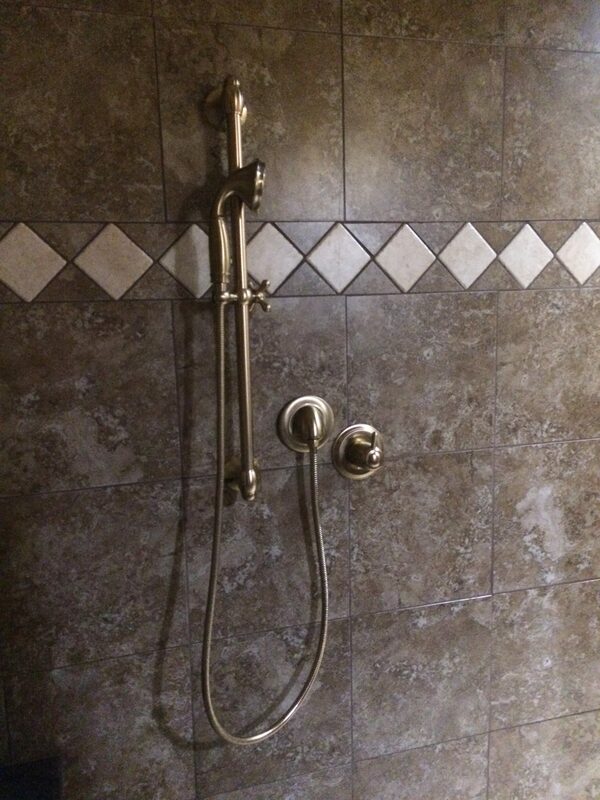 The shower is not on the hot water loop but is piped directly from the hot water heater with original 3/4″ hot and cold copper pipes that once supplied the laundry. 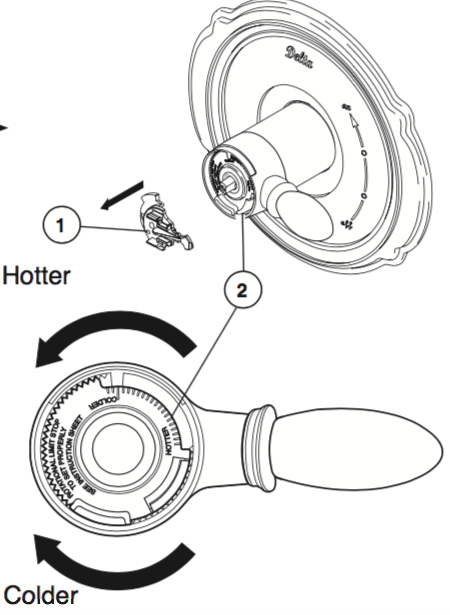 So the shower is on its own supply that does not wait very long to get hot. 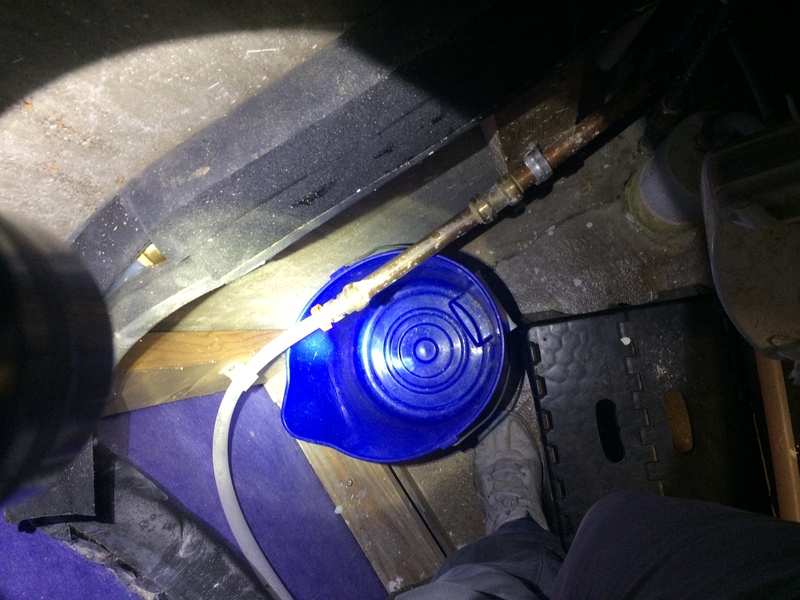 The pipes to the diverter are also insulated to keep the water running hot. Now that hot is hot and cold is cold it should be a very comfortable shower. Have I ever mentioned I hate caulking? 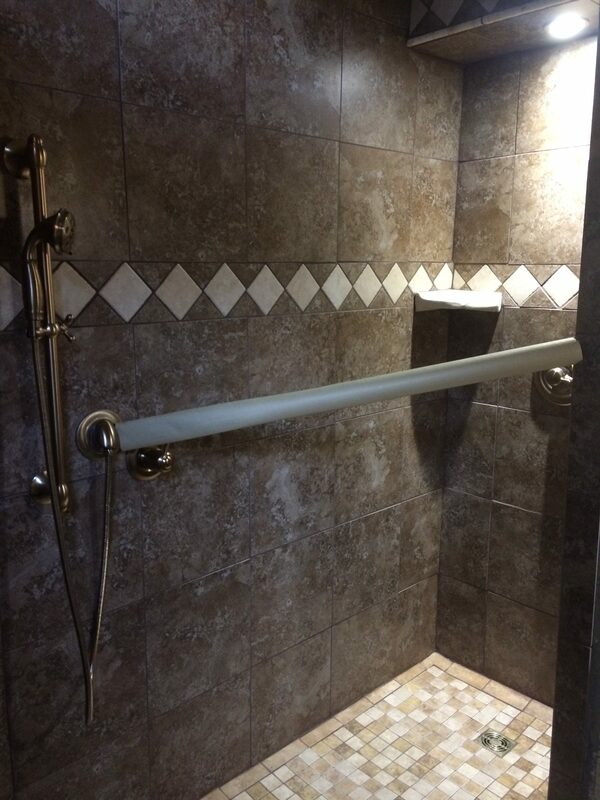 The family room shower is large and that meant lots of caulking. 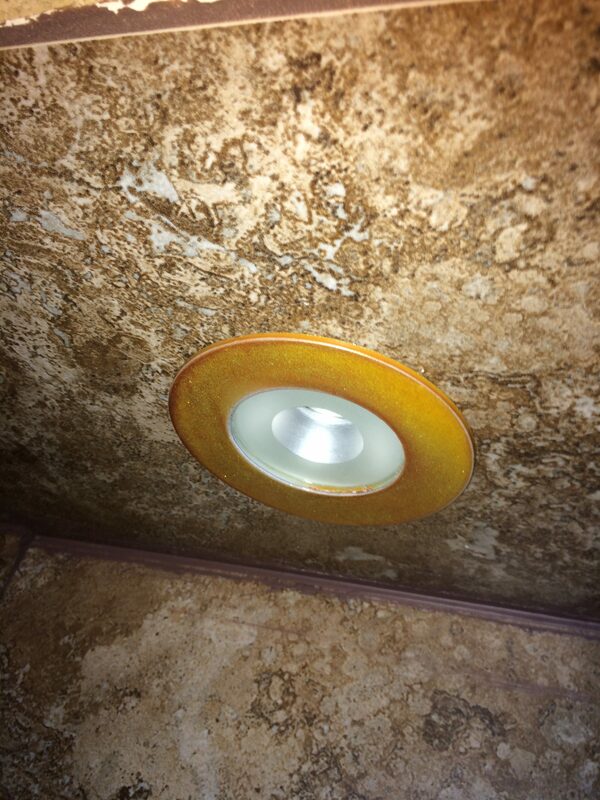 At the ceiling, at the floor, in the corners and inside the niches; all needed caulk. 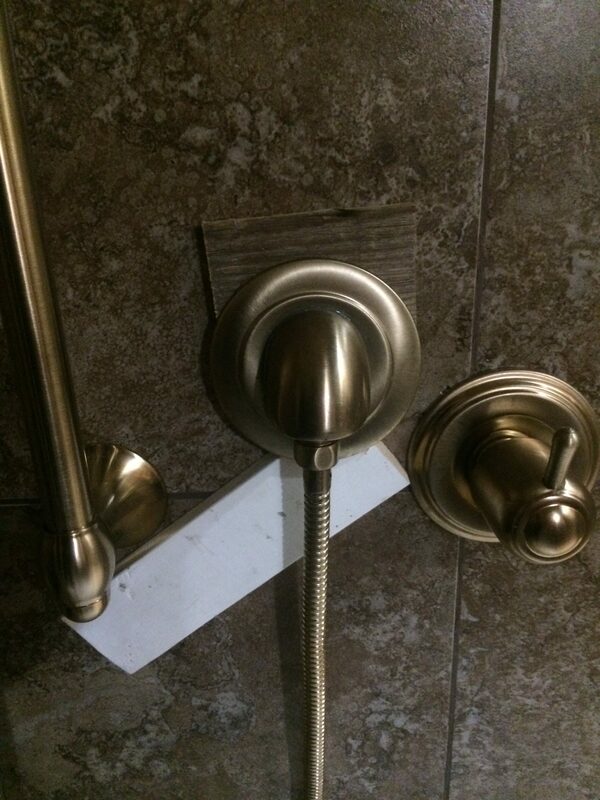 I used the same dark brown low voc caulk that I used in the master bathroom-Dynaflex 230 by DAP. 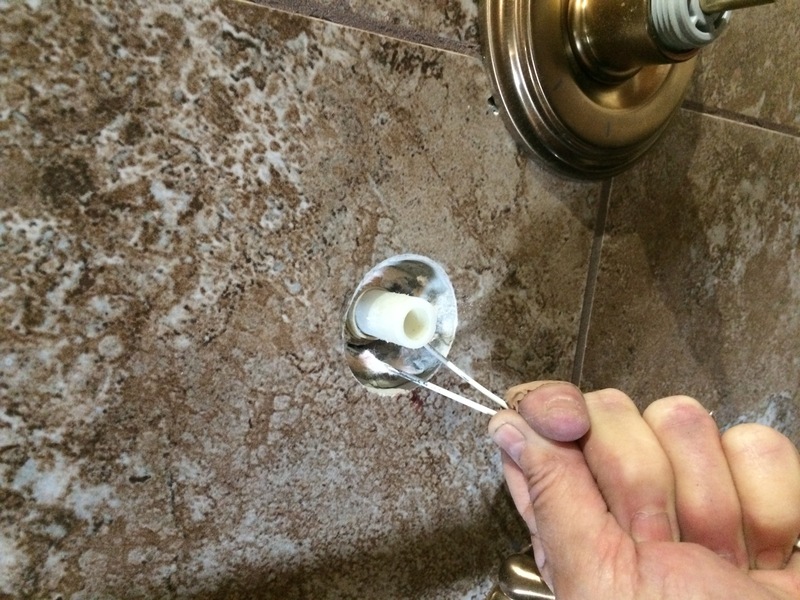 No matter how I try I cannot smooth the caulk with a wet finger as others do. Instead it gets all over the joint. I have tried various ways to clean up the mess this makes and so far pushing the caulk into the joint with a wet sponge works the best for me. 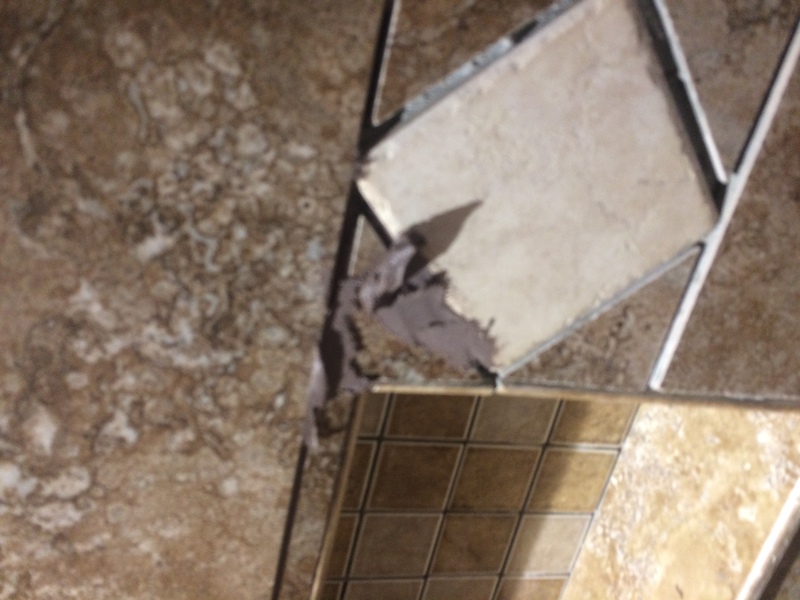 It is not very smooth but it is also not all over the tile on each side. For this large caulking job I used the tool I bought for the huge caulking job in the crawlspace. I had a half used tube of caulk that I couldn’t get to flow again with a hand caulk gun and the battery powered caulk gun was just the ticket. 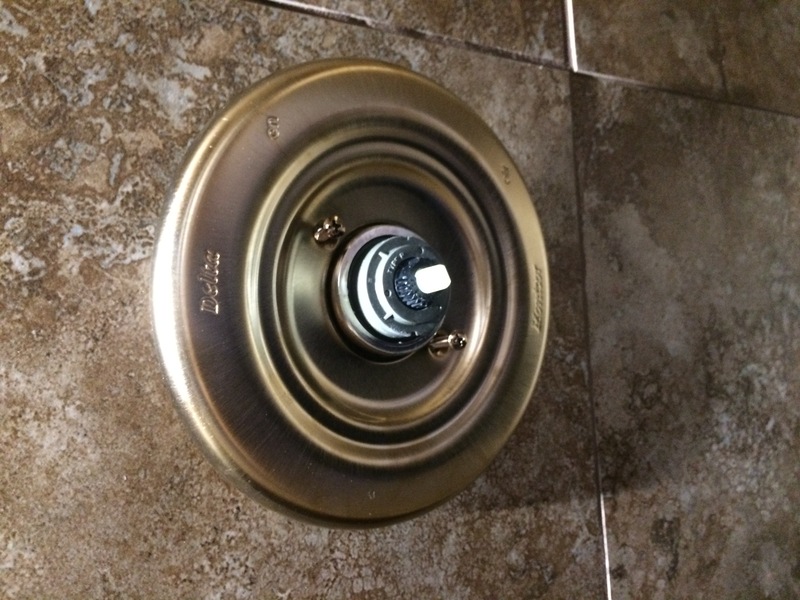 I had cut the caulk spout with a small opening and set the gun on its lowest feed setting which worked well for most of the caulking until I smoothed it out with a wet finger while wearing a surgical plastic glove. 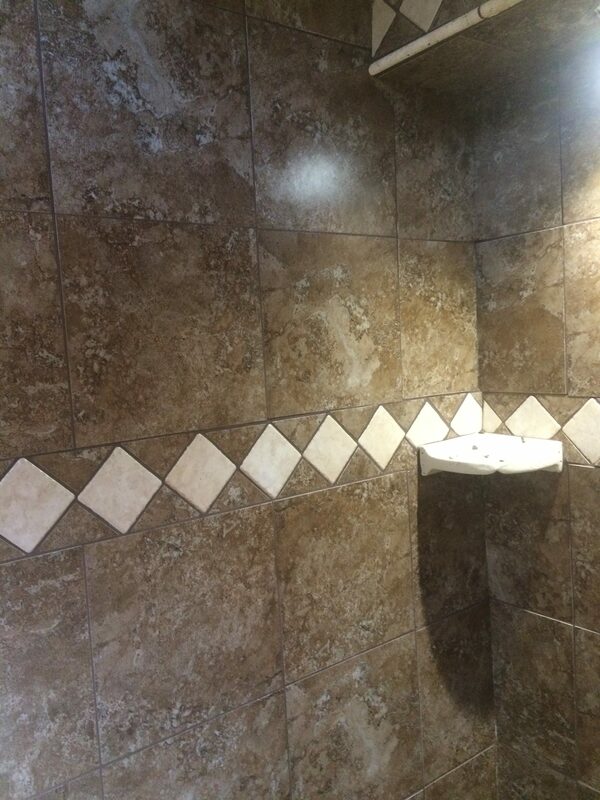 By the time I got all the joints trimmed back with a wet sponge and scrubby for the excess, I had let the caulk in the shower niche dry too much to scrub off! 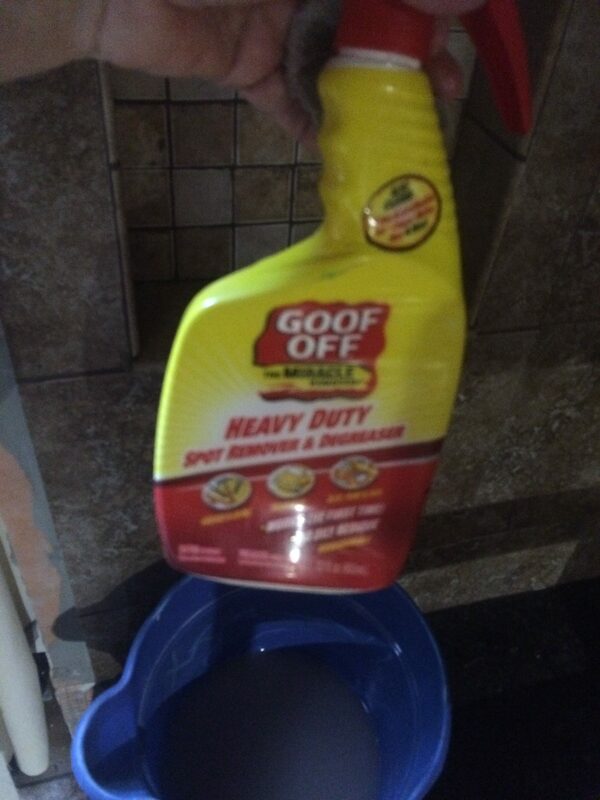 Luckily I had some Goof Off which works on tar and caulk! I sprayed it and let it work for about an hour and then came back and it made short work of cleaning off the excess caulk. I had a nice piece of dark brown granite already cut for the bench. 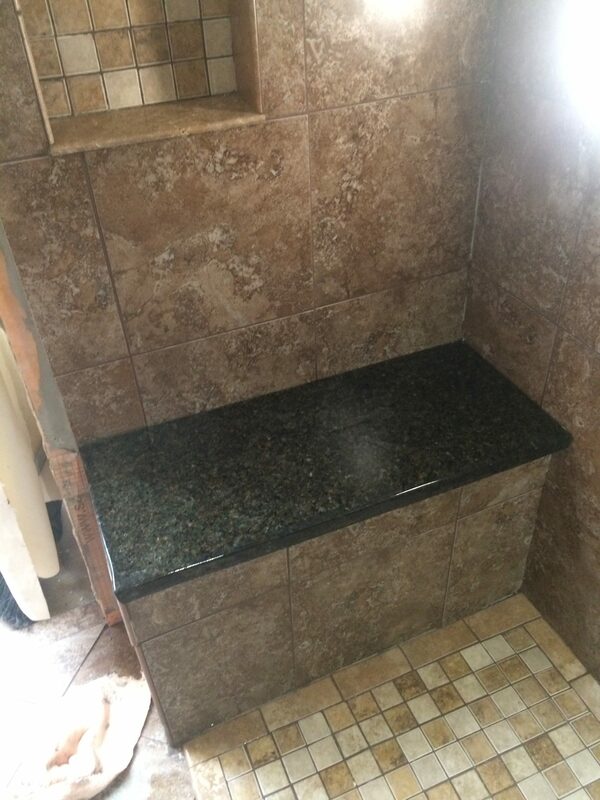 Originally I wanted to use left over granite from the sink top but it was not wide enough to completely cover the bench, and the narrow pieces I had cut for the master shower were too difficult to install. 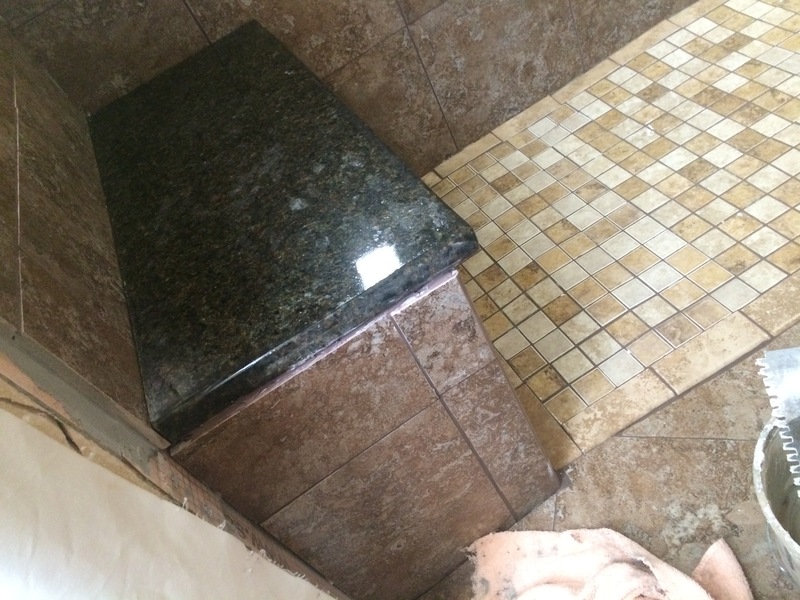 So Bill had me go out and get another granite remnant to cut one wider piece for the master shower ledge and have enough left over for the bench in the family room shower. 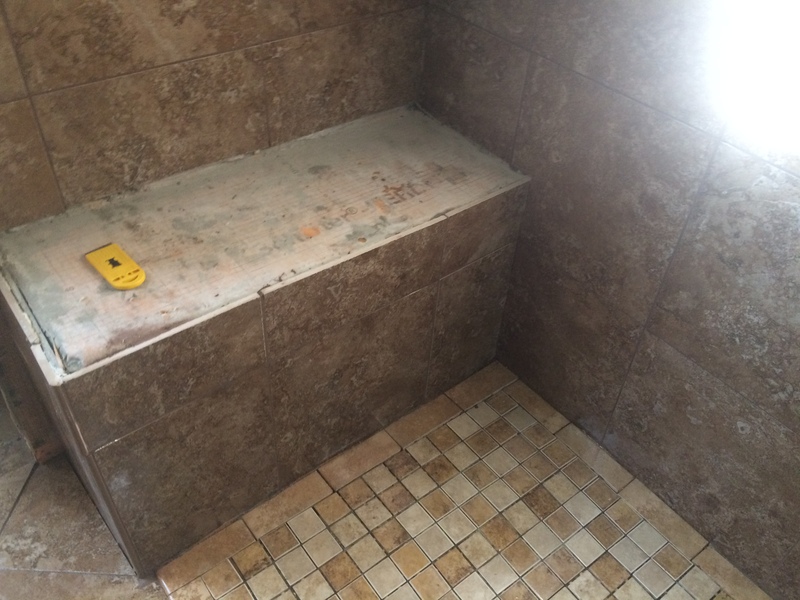 Although I had the bench seat cut about to size already, after fitting it over the tile edge of the bench I decided to trim off another half inch using the wet saw so that the bench didn’t overhang into the bathroom. Then I had the arduous task of polishing the edges. I have a series of diamond sanding wheels and the roughest one can round the edges of granite. Then it takes about seven more grits to get a polished edge. If one grit doesn’t do its job then it is necessary to back track and try to move from the lower grits again to the higher. I don’t have enough patience for this so I left the edge a bit marked up. I’m hoping the sealer will cover it. 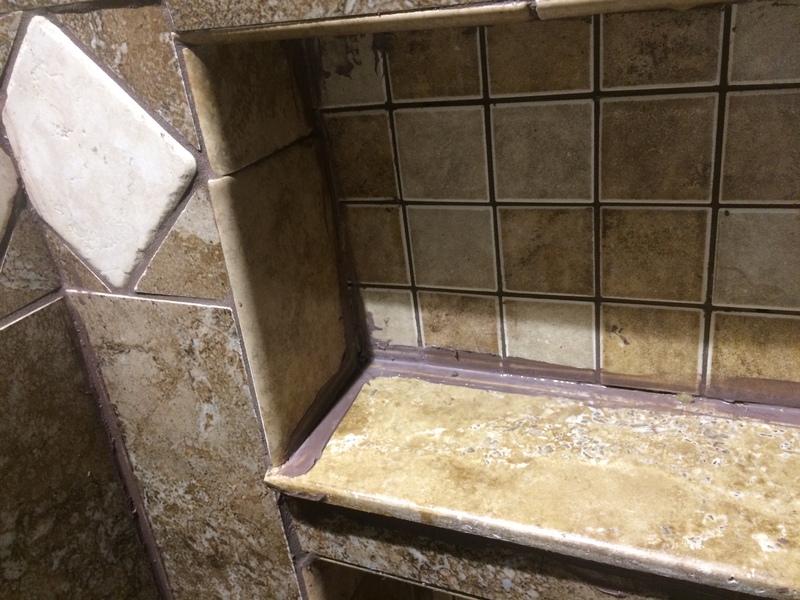 There was waterproofing at the bathroom edge of the bench, but the handyman had a problem with the corner of the bench so to fix that I added a piece of cement board to the end. 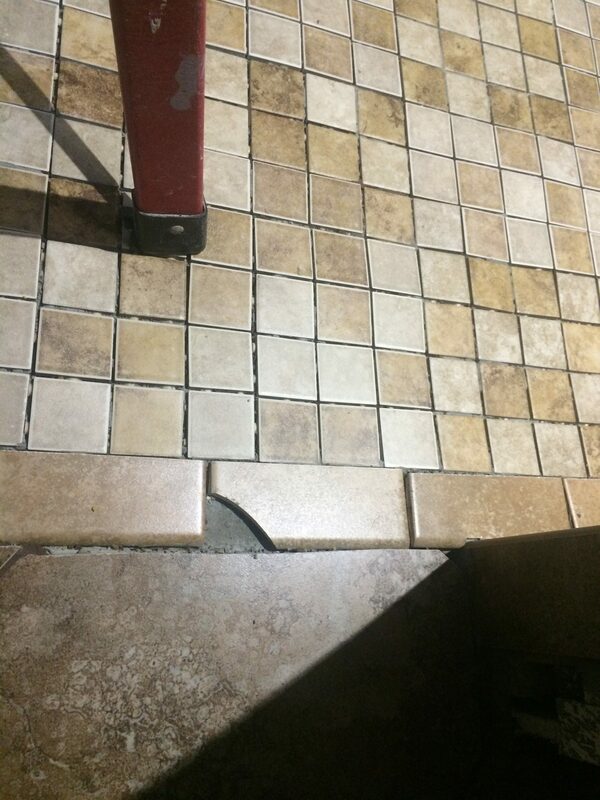 That meant a gap between the waterproofed bench and the tile. 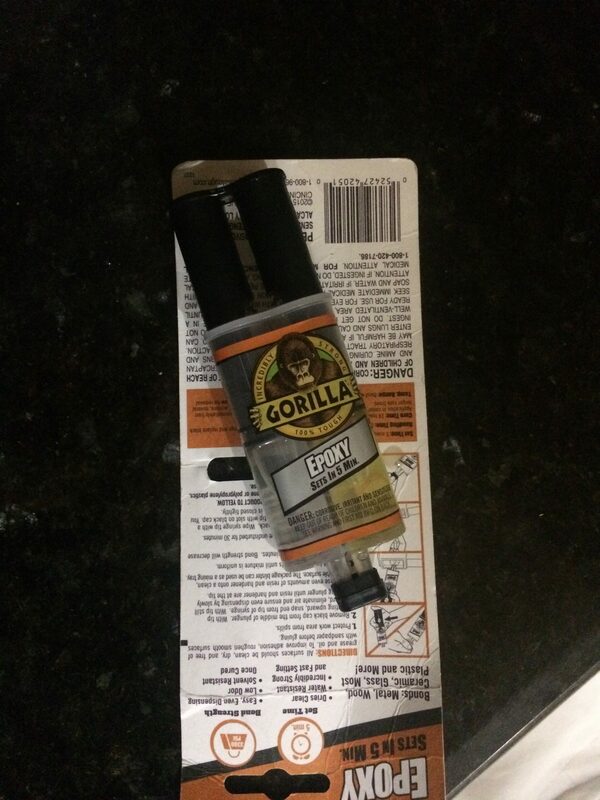 So I filled that with caulk. 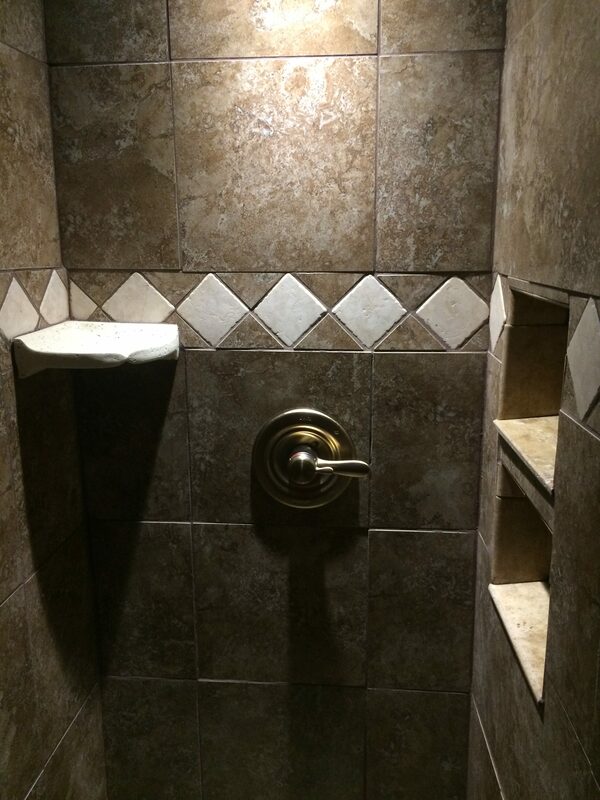 Bill had bought special mortar to set the master shower ledge. There was plenty left to mix up a small bucket of it for the bench. 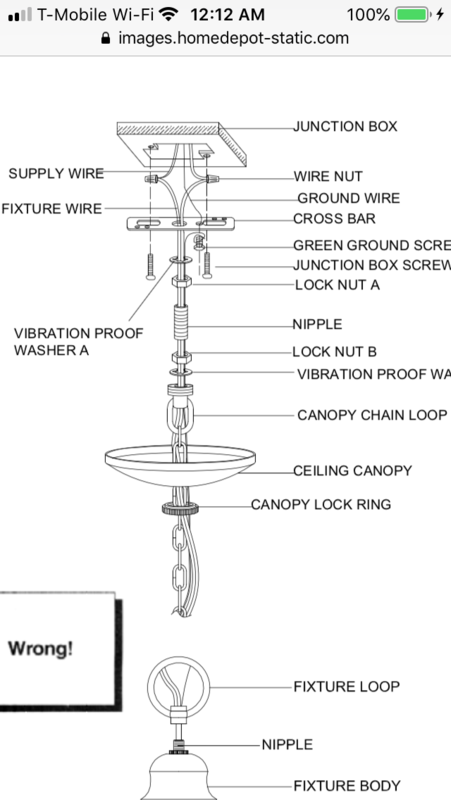 Just in case there was something special about setting the granite, I looked up instructions on the internet. But there was not more information than just coating the bench and the granite with mortar spread with a 3/8″ trowel. Then I picked up the granite and laid it on the bench. A bit of settling it into place by shaking it back and forth to get a good set. 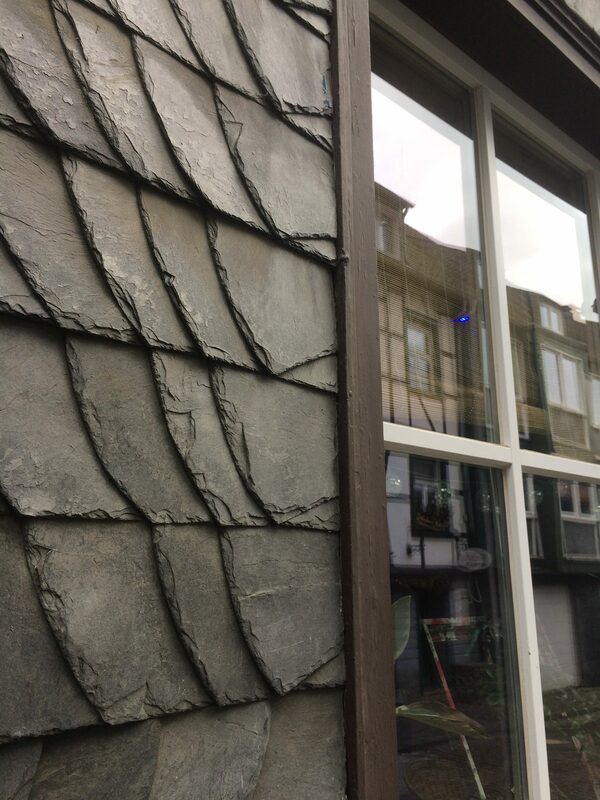 And cleaning off the excess mortar provided a nice preview of what the finished product will look like. I didn’t plan ahead and I had to wash that thick layer of mortar off the overhang which was messy and kind of a pain. I also checked the slant of the bench with the plumbing level and it was good. Setting the bench was a short job that made me feel like I was getting close to finishing the project. 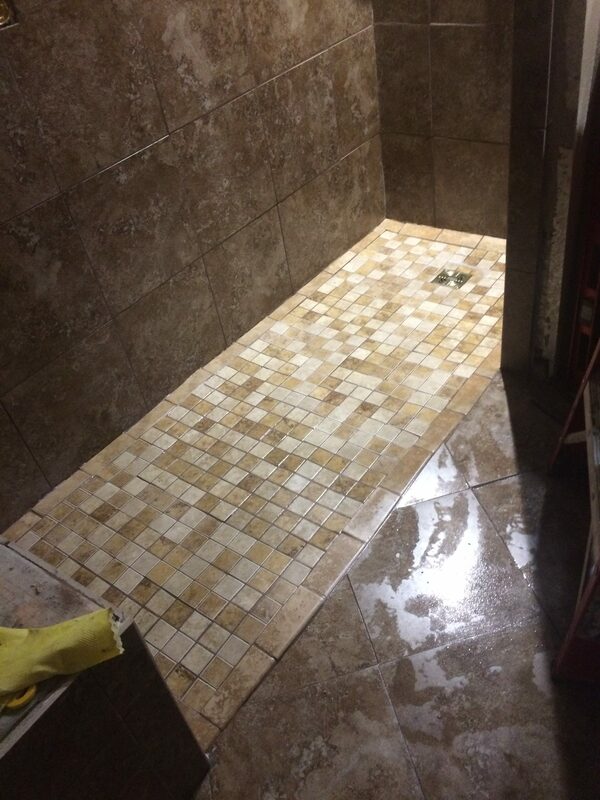 The shower is getting closer to being finished! The floor layout has finally been mortared into place. 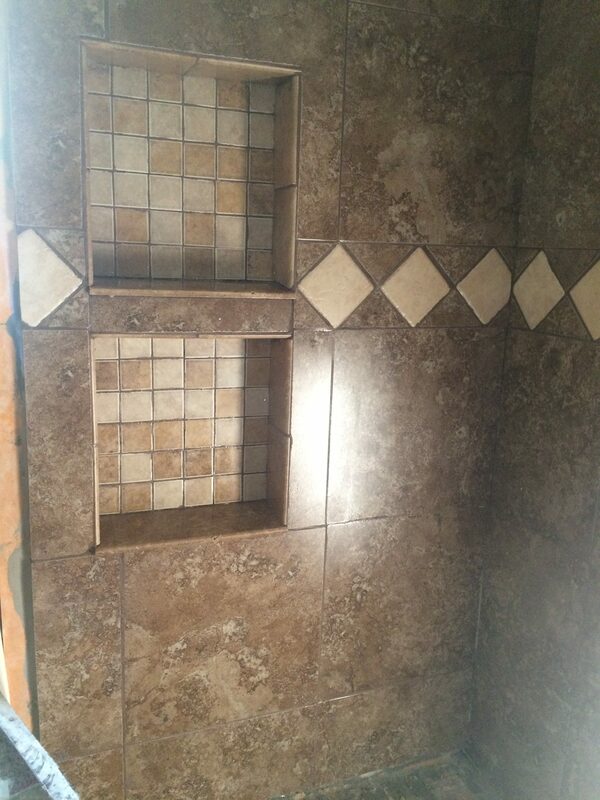 I mortared the mosaic tile first, then waited a day to mortar the trim tiles. That way I could adjust them to the space around the mosaics. 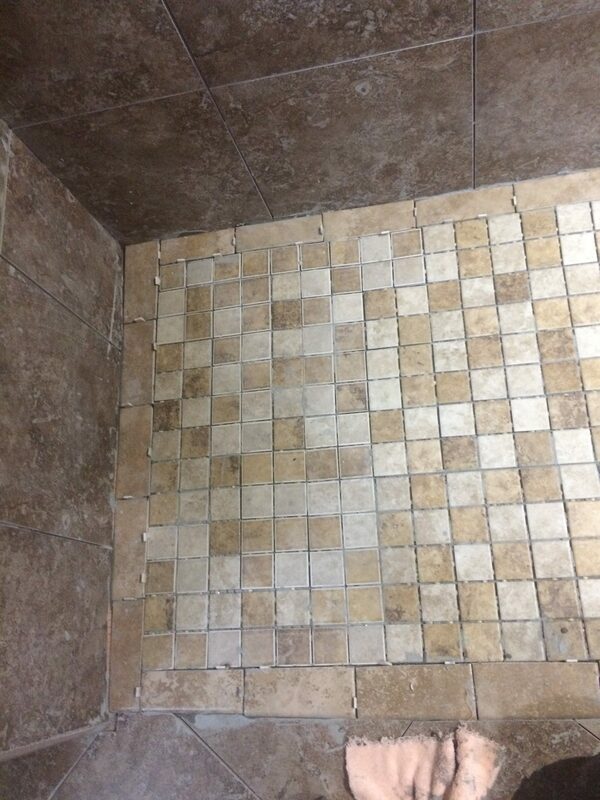 If you are paying attention, you can tell that the trim tiles on both edges of the drain side of the shower get narrower. This is due to the wall on the right not being exactly square. Oh well. 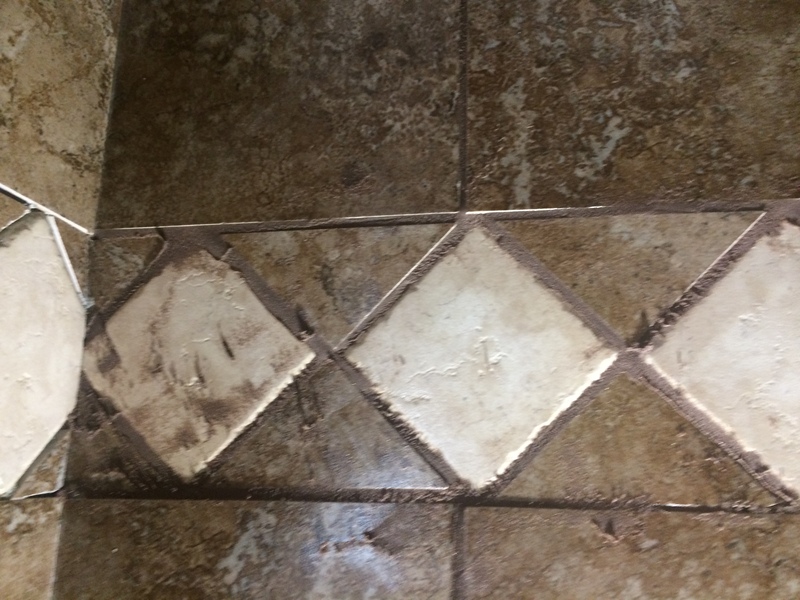 The left corner L shaped tile is one piece because the corner was so uneven that it was easier to mortar in one piece than two. You can see some of the wall tiles put in by the handyman were not pressed even. Or they were and they sagged out of alignment. That just meant I didn’t feel so badly about my uneven tiles. 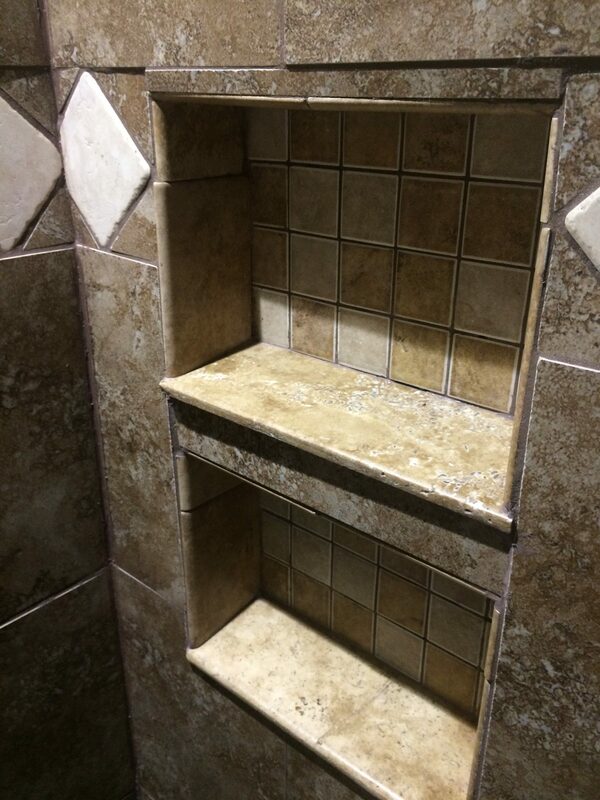 The back wall tiles show the taper to correct about half of the slant in the front of the shower. I don’t think the taper is jarring here. The trim tiles at the rear along the bench seat are a bit tapered but it is much less noticeable. 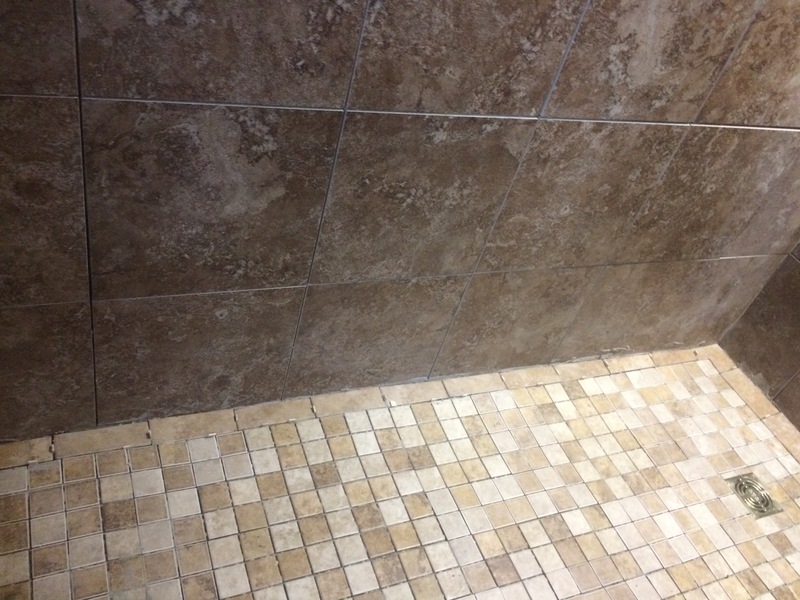 And the tiles against the shower opening also taper but not as much as at the partial wall near the drain. 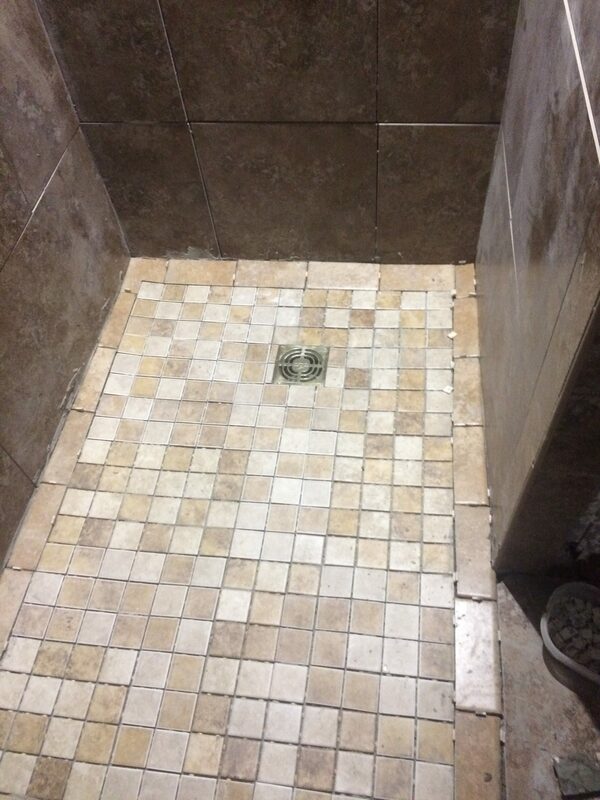 The few remaining bathroom floor tiles were cut and mortared into place. I had to recut two of them because I left them tilted up against the doorway and they fell over and broke! 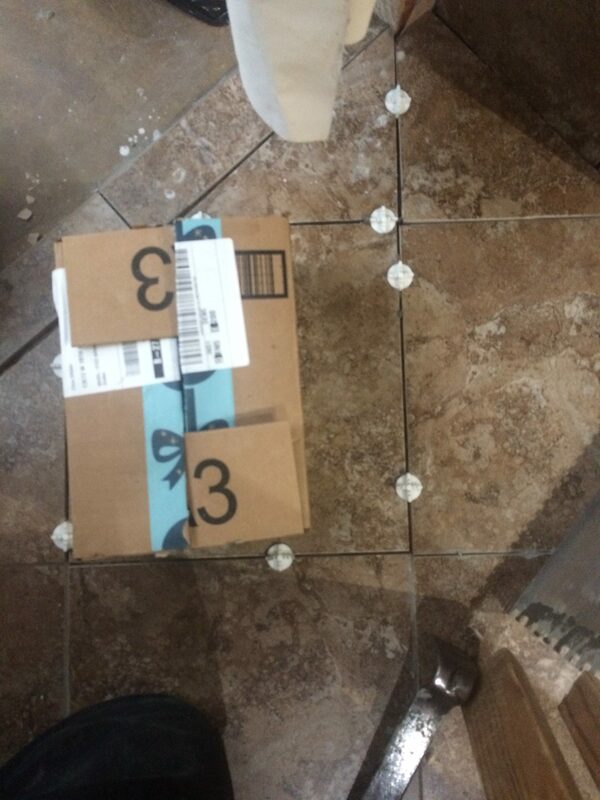 The box was just to remind us not to step on the newly mortared tiles. 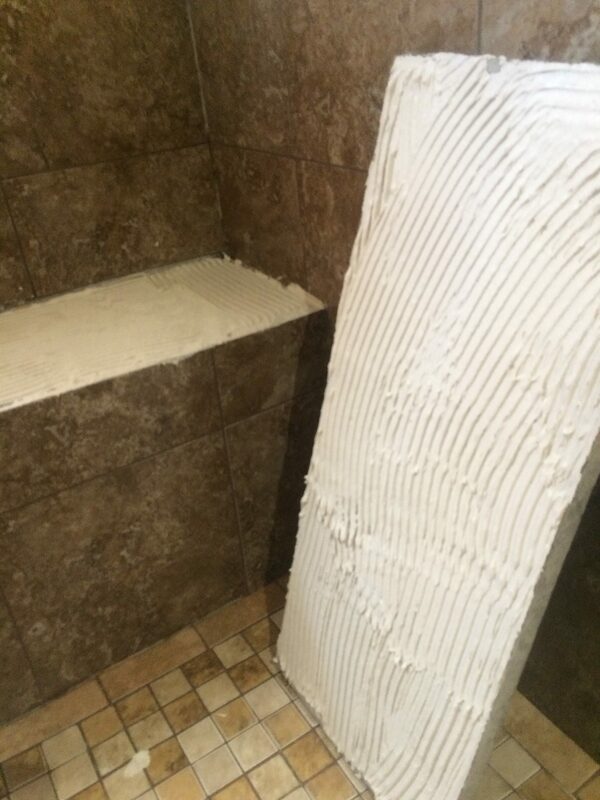 Luckily the rest of the tile was mortared into place before the weather turned snowy.